Note – If you have read this article before and are checking back in, it would be a good idea to clear your cache, to ensure that you are viewing the very latest version of this post. I do add material and make corrections from time to time. It’s been about a year since I finished building The Sproutie, and it’s been a good year. Of all my scratch-built projects, it has been the most satisfying to own. It works well, looks pretty good and also, there is always the lure of possible of tweaks and improvements. 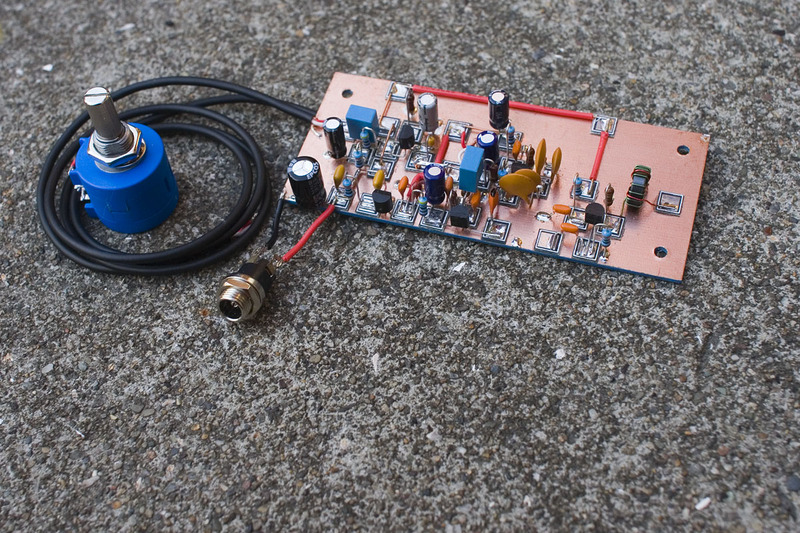 This is partially because it’s a home-brew project, and also because it’s a regen 🙂 It was really enjoyable to build a receiver with the basic circuit architecture taken from the 1930’s, but with a combination of solid state devices and lovely old vintage parts. Initially, I was hoping to use a different type of circuit for this receiver from the tried-and-tested front end used in The Sproutie. I did build VE7BPO’s regen #4 and had some trouble with it picking up a local FM broadcast station. In retrospect, I should have realized that I have had this issue with other simple receivers at this location, until they were cased up and grounded properly. The problem seemed to be a little worse than normal, but this could well have been due to the amplification factor of Professor Vasily Ivanenko’s hycas detector. I gave up far too soon and headed for the security of the front end I used in both the first version of my Sproutie, and the WBR. It is, of course, the circuit used in Nicky’s TRF, as featured in issue 70 of SPRAT (with a few corrections and suggested mods in issue 72). Incidentally, “Bear” NH7SR built a very functional version of Prof V’s Regen #4 which he described in this thread over on The Radio Board. 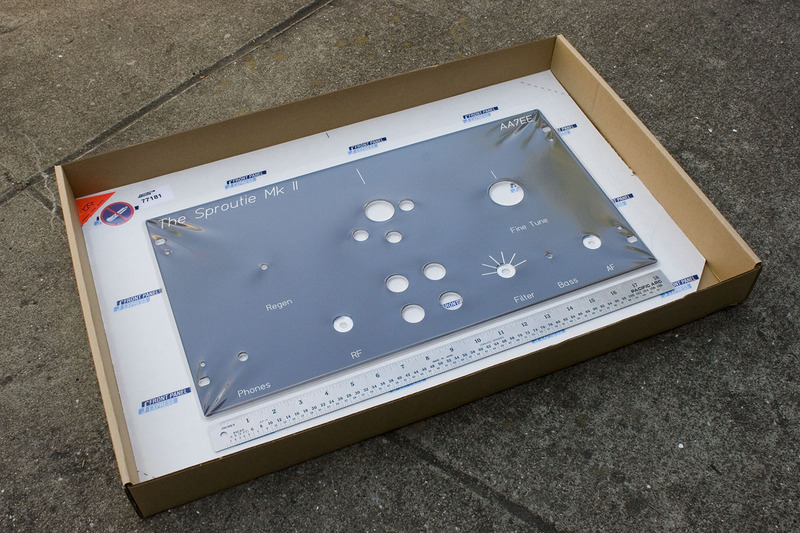 However, I didn’t just want to exactly duplicate the circuit of The Sproutie, even if the new receiver was going to have a different physical form and different hardware. This new receiver would have to have some alternate type of circuitry that would make it worth building. I was interested in trying a different type of filtering in the audio chain, and a tip from Prof V in his Solid State Regenerative Receivers group on Google+ clued me in to a great tool for designing active audio filters (more on that later). The pieces were beginning to come together. I had a bunch of NE5532’s in my parts stash that had sat unused for a couple of years and it struck me that a regen which utilized a series of active audio filters for different bandwidths, switched from the front panel, might be an interesting idea for a receiver. The LM380 output stage I had used in The Sproutie works well, so I saw no reason to change it. It is fairly low noise, a welcome factor that makes it possible to listen to a receiver comfortably for long periods of time. 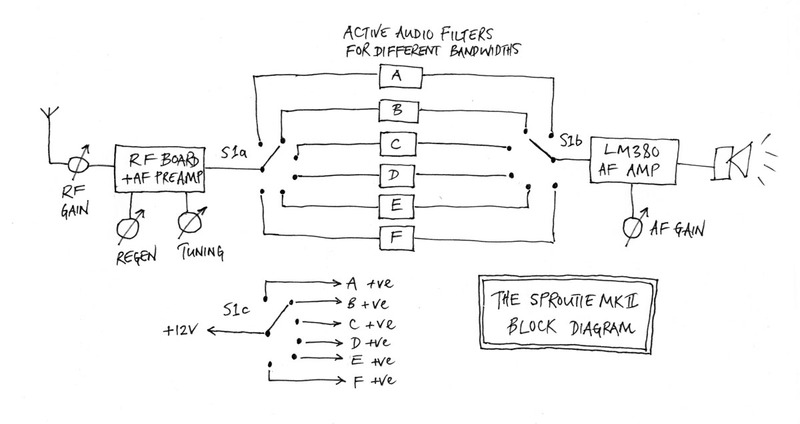 Fig 1 – Block diagram of The Sproutie MKII. Note that S1a, S1b and S1c are all part of the same rotary switch. 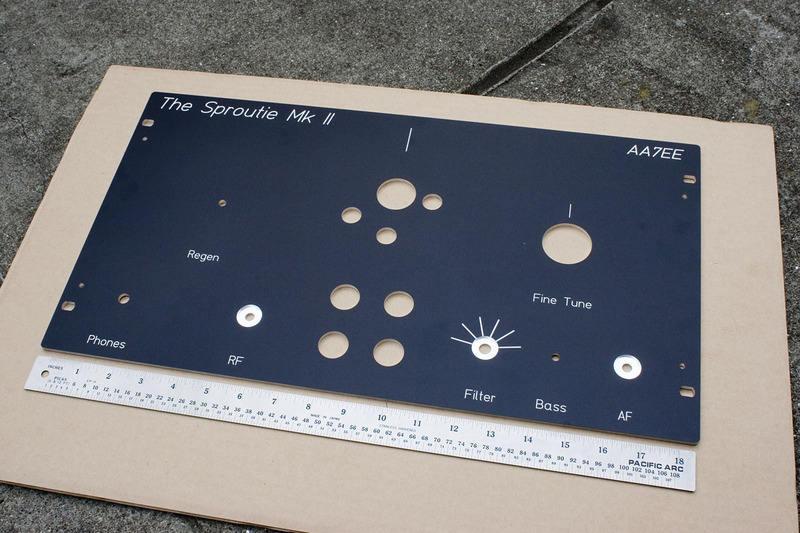 The front end, as I mentioned, is exactly the same one I used in the original Sproutie. It is the one used in Nicky’s TRF featured in issue 70 of SPRAT. I thoroughly recommend joining G-QRP. Your initial membership includes an archival DVD of past issues of the club magazine SPRAT, which is a very valuable resource for homebrewers. 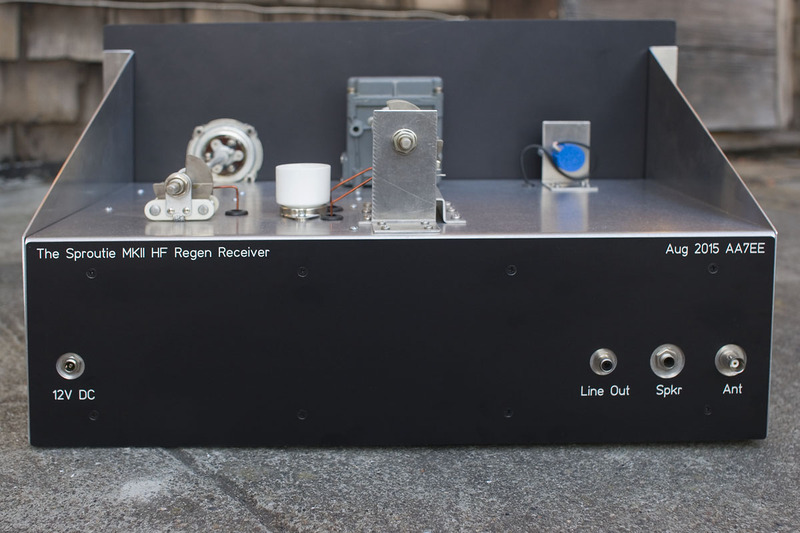 If you have access to this archive, you should also take a look at issue 105, in which a slightly different version of the same receiver is featured. It employs a simple passive LC audio filter, if you’re not keen on the extra complexity that my version here entails. 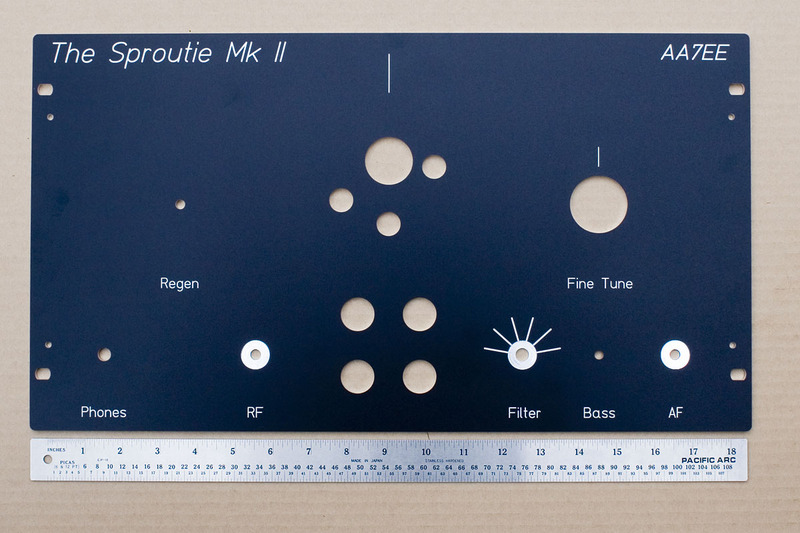 Fig 2 – The Sproutie MKII front end, with details of plug-in coils and fine tuning capacitor removed for simplicity. Fig 4 – The AF output stage. The “bass” switch only gives a very gentle lift to the lower frequencies. The effect is so subtle that you won’t be missing much if you leave it out. I wanted a “straight-through” position to give me something to compare the other filters to. All the filters, with the exception of the narrow CW filter, were designed with a 6dB gain, so I designed my “straight-thru” filter with a 6dB gain also, so I could step through the bandwidths seamlessly. If doing this again, I would have given the filters a bit more gain. I’ll explain why later. 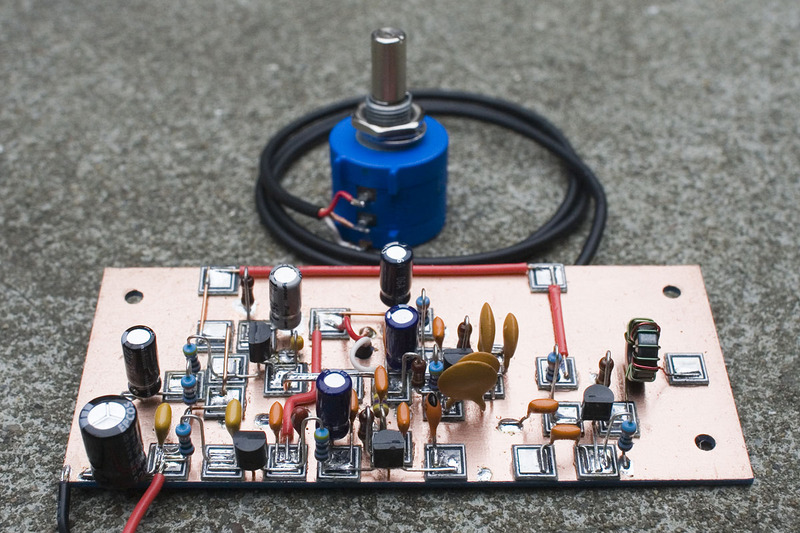 Dan N7VE gave a talk to the Arizona QRP Scorpions a few years ago on (among other things) designing active audio filters. It’s definitely worth taking a look at his presentation, which is available here. In fact, I wish I’d paid attention to it before embarking on designing the filters for this receiver, as I would have tweaked some of the resistor and capacitor values a bit. 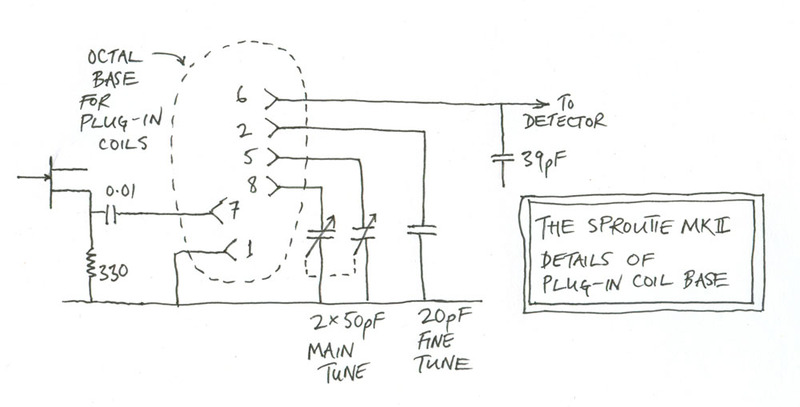 Dan explains how it’s desirable to keep the resistors in the main signal chain fairly low in value, to avoid noise. He recommends trying to stay under 1K. 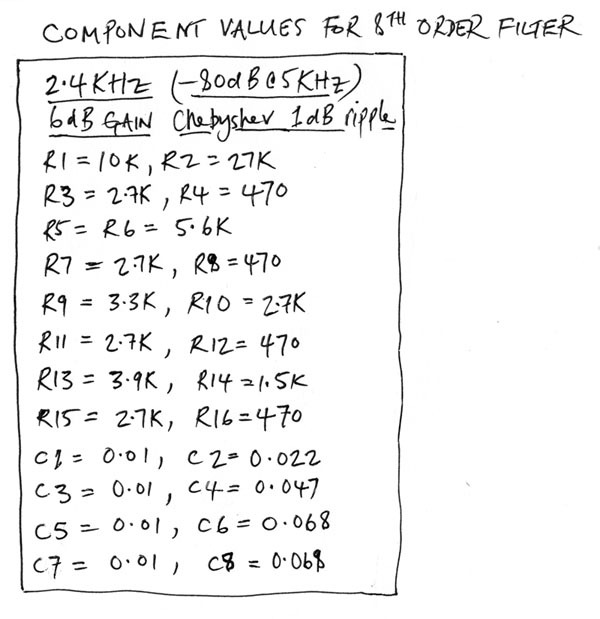 I only read the presentation before designing the very final filter – the CW one with a cut-off of 700Hz – so while my resistor values in that filter are nice and low, they are not quite so low in the others (though in my defense, they are not atrociously high either). I wasn’t interested in the shape of the response as, for this stage, all I wanted was effectively an unfiltered stage with a gain of 6dB. 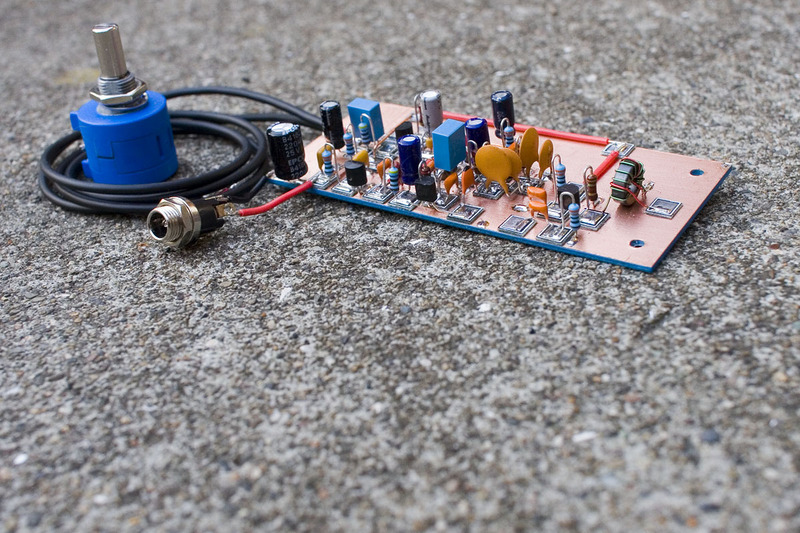 For this reason, I used just one half of a dual op-amp 5532 package as a real-pole filter. Filter Pro doesn’t show the power supply and biasing arrangements, so I added the 2 x 47K resistors to keep the input biased at about half of the supply voltage. I also added the 10uF capacitor, which keeps the bottom end of the 1K resistor at ground potential for audio signals, while blocking the DC bias. I also added the lowpass filter formed by the 10 ohm resistor and the 100uF electrolytic on the supply line, as well as the 0.1uF ceramic RF bypass cap on pin 8 of the IC (mounted close to the pin). I don’t know how essential these 0.1uF caps are, but the datasheet suggests them, and they can’t do any harm. The other filters were all 4th order low-pass filters (2 stages = 1 x 5532 dual op-amp package), with the exception of the 2.4KHz filter, which was an 8th order low-pass filter (4 stages = 2 x 5532 dual op-amp packages). The 8th order filter has a sharper cut-off, of course. Feel free to design your own filters, with the help of Filter Pro, for whatever cut-off frequency and rate of roll-off you wish. 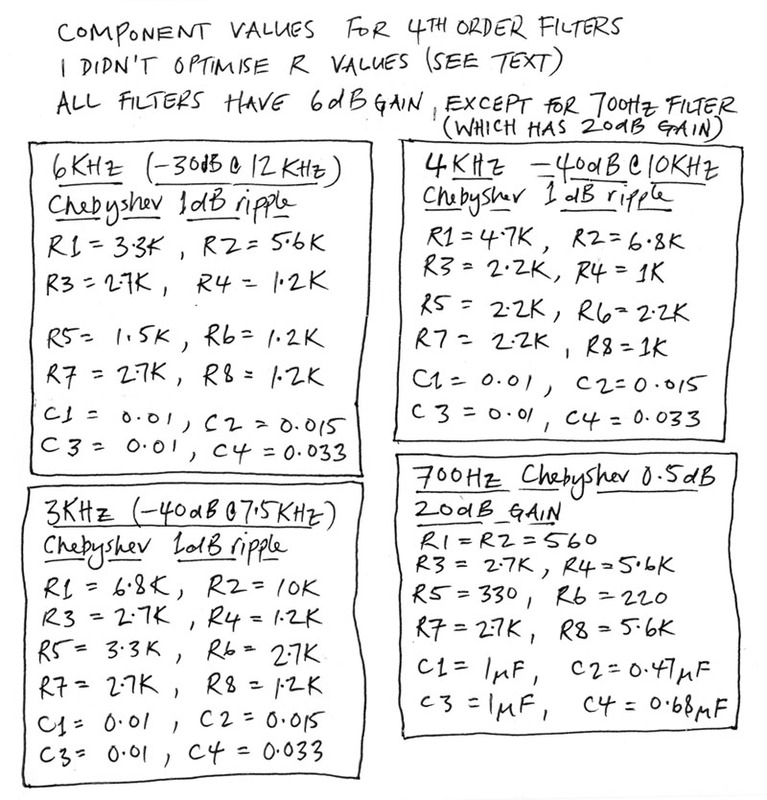 I’ll show you the R and C values I used for my filters but you might want to fiddle around with the software and come up with your own values that keep the R values in the main signal chain at or below 1K, if possible. The resistors in the first stage of the filter are particularly important, as the noise they produce is amplified more than noise produced in later stages. Just click on a component in Filter Pro, enter a different value, and hit return to see what new values of the other components the software has calculated. A bit of trial and error should get you close. Also note that you can specify the series of resistor and capacitor values you want to use (E96, E48, E12 etc), and watch how the filter response curve changes as you change the tolerances and values. 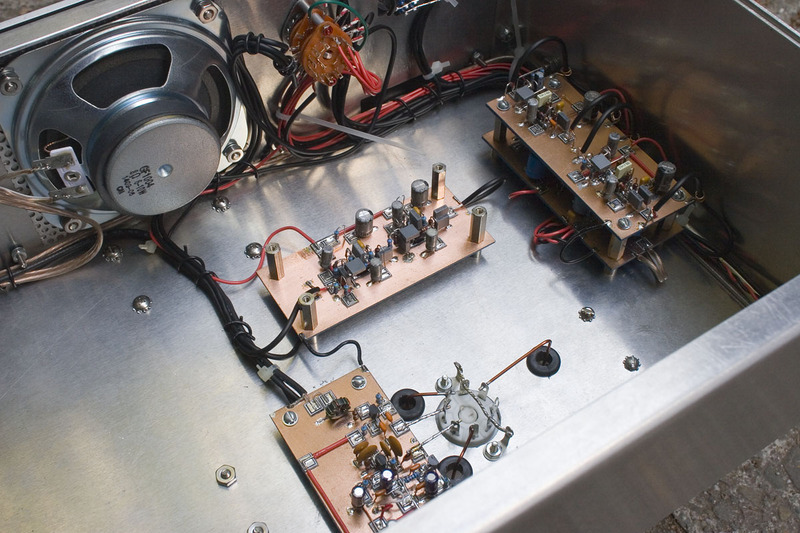 After I had built the receiver and all these filters, and done some listening, I concluded that for SSB and CW, a bit more filter gain would be helpful. The set has plenty of gain when listening to AM but on CW/SSB, the RF gain has to be wound right down to prevent the oscillator pulling. 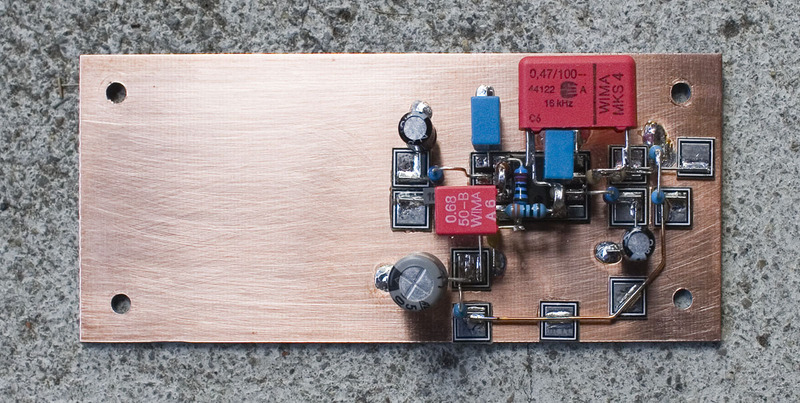 This creates a need for more AF gain in the CW/SSB modes. At the time of writing this, I have only just finished building this set and have no enthusiasm for building more filters. 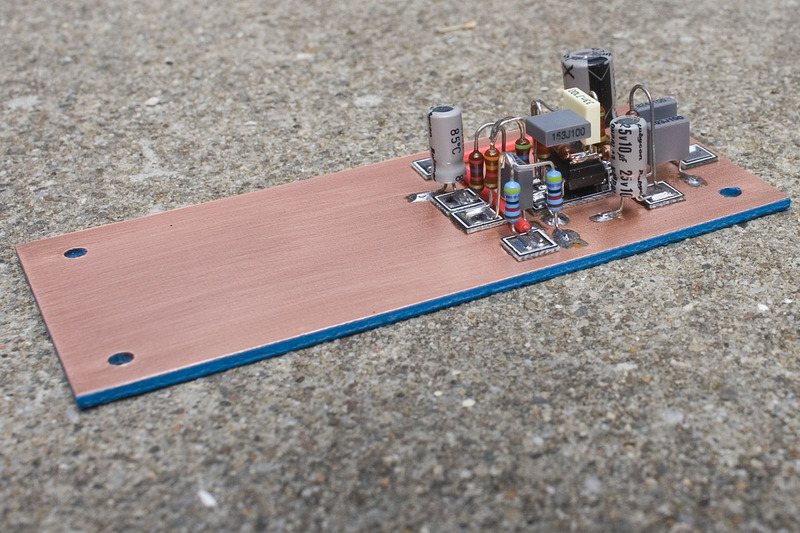 I actually had to build 8 filter boards to get the 6 that I used, and 3 front end boards to arrive at the final one. Together with the physical side of the construction, I am tapped out right now and have no desire to construct anything else at all for a while! 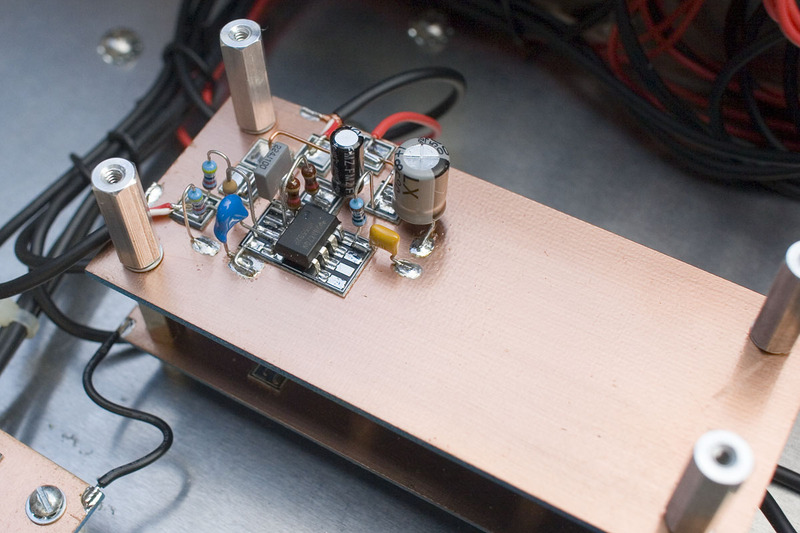 If you want to use this receiver mainly for SSB and/or CW, you may want to experiment with the value of the NPO capacitor in the front end that connects the hot end of the main tuning coil to the base of the 2N3904 oscillator transistor. It is listed on the schematic as being 39pF, and that is the value I used. However, it is possible that a lower value will cause the oscillator to pull less on strong signals. Of course, the lower value might also reduce the signal strength into the detector which will put you back to square one. It’s worth trying though. I’d be tempted to try a value as low as just a few pF. 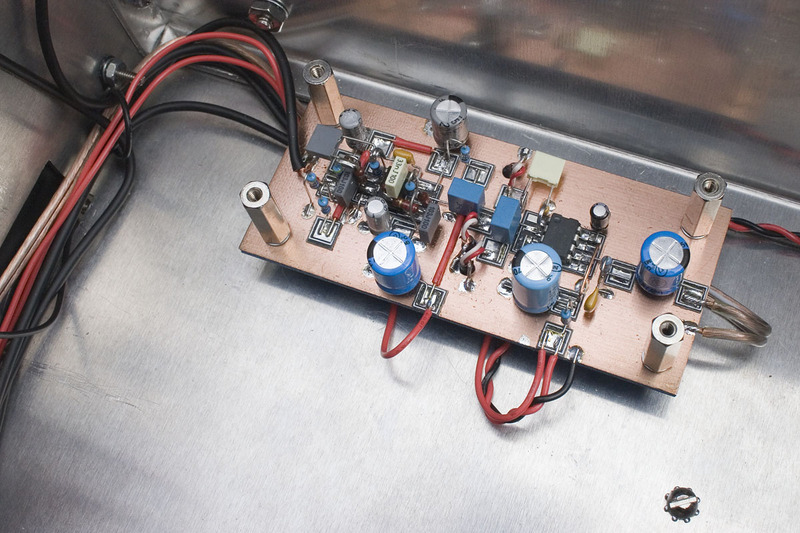 Remember that changing this capacitor will affect the frequency coverage – particularly at the top end of each range. 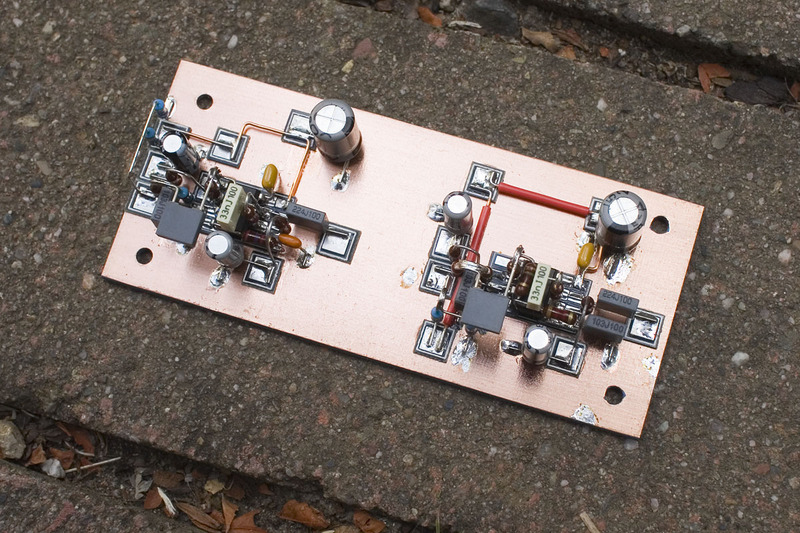 When building the filters, I originally built the 700Hz CW filter with a gain of 6dB, like the other filters. The idea is that if they all have the same gain within their passband, the operator can step through the different bandwidths without a change in the volume of the wanted signal in the speaker. This was the way it worked except with the 2 narrowest filters. The 2.4KHz 4 stage filter had a slight, but noticeable drop-off in volume. The effect was very pronounced with the 700Hz filter – so much so that I redesigned it with a gain of 20dB and still found that there was a slight drop-off in volume within the passband as compared to the other filters. I don’t know the reason for this. EDIT – Thomas LA3PNA Tweeted the following explanation – “The perceived loss when changing filters is because the power delivered to your ear is 10log(BW of filter) and less with less BW. So basically, the reduction in noise makes it sound like the volume goes down” He also gave a very useful tip for adjusting the gain of the filters so as to preserve the perception of constant volume – “I like to add gain in a filter circuit after the formula 20log(bw/orginal bw) for AF filters” That is very useful information Thomas. I’m a little tapped out after building The Sproutie, but if and when I decide to revamp the filter bank, I’ll be paying attention to this formula. I may, at some point, rebuild the 3 narrowest filters with higher gains. If that ever happens, I’ll report the results here in this post. Incidentally, at this point, allow me to say one more thing about the filters. If building and wiring up all these filters sounds like it is making the construction of a regen overly-complicated, I can definitely sympathize. 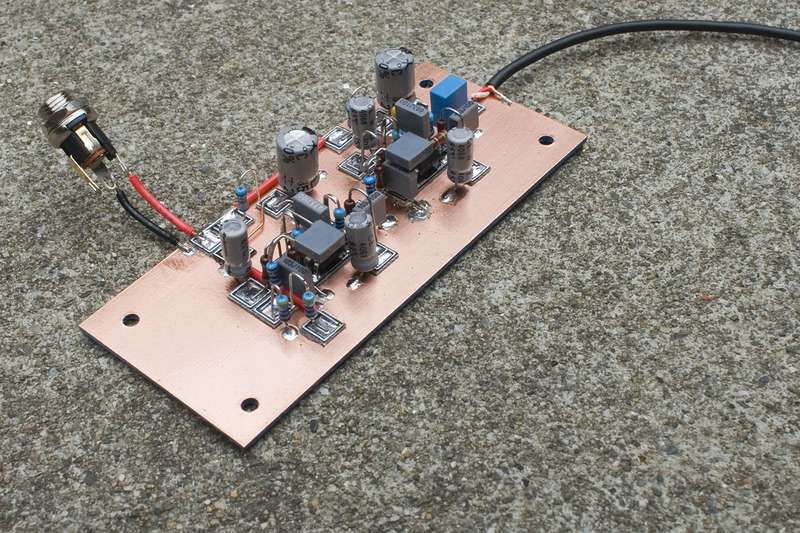 If you want to use this set for CW, SSB and AM and you want to permanently wire in just one filter, I’d go for a 4th order (2-stage) LPF with a cut-off of 3KHz. The one I have is perhaps a touch wide for SSB (it’s roughly equivalent to a 3.3KHz passband filter, as explained earlier) and a bit narrow for AM broadcast, but it’s a good compromise for both. If it were the only filter I had, I know I would get used to the sound of it. As for the gain, mine has a gain of just 6dB, but I’d like to up it in order to have a good volume when turning the RF right down, as is necessary to prevent oscillator pulling on SSB/CW. I can’t know until I’ve tried it, but I’m thinking something along the lines of 26dB gain. Just make sure to be careful when on AM, as you may find that you have way more gain than you need – so keep an eye (and a hand) on that RF gain control. 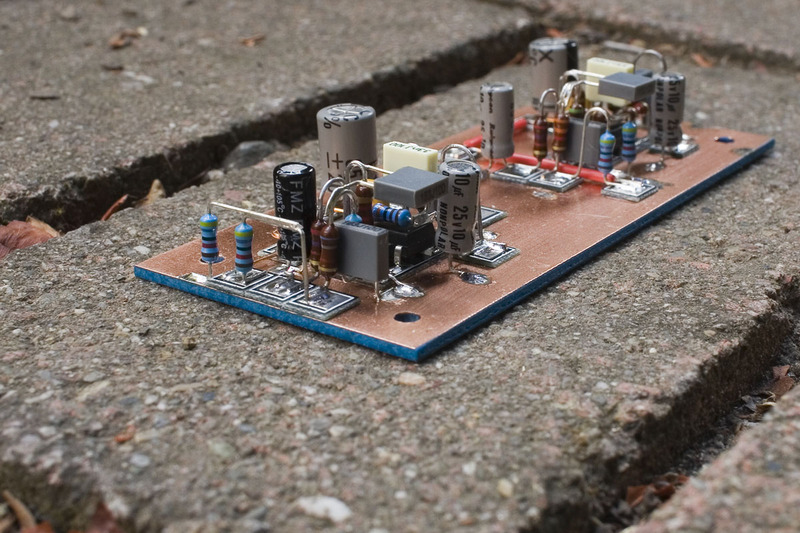 A big part of the inspiration for building this receiver, as I mentioned earlier, was the physical form of K4XAF’s version of NR5Q’s Ultimate Regen. In the search for a National HRO dial and gear drive in really nice condition, I bought several, and finally came up with a dial and drive combination that just cried out to be included in this receiver. 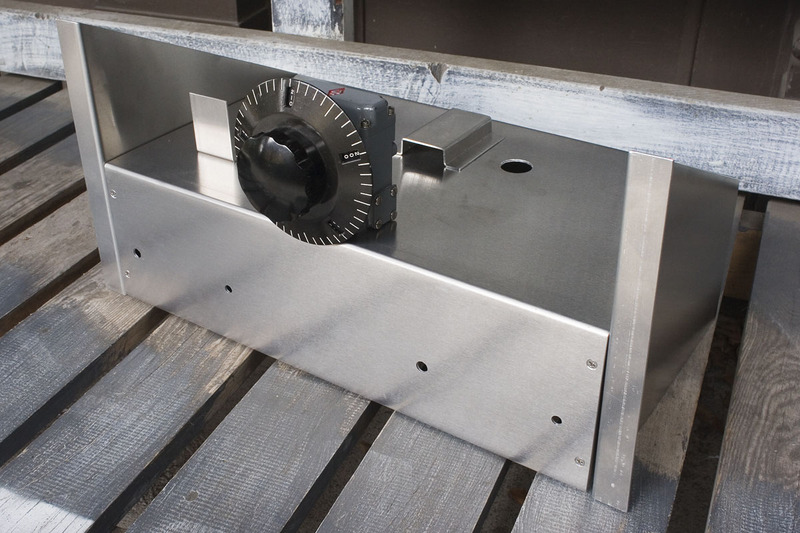 This gear drive has a shaft rotation limiter, which was perfect, as the tuning capacitor I wanted to use didn’t have any kind of rotation limiting built in – it was the capacitor in the first photo in this post – a Hammarlund MCD-50-M. The final M stands for midline, referring to the fact that the off-center shaft and shape of the vanes help to make the tuning a lot more linear than with regular variable capacitors. With a standard capacitor, you’d find that the frequencies would become very compressed at the top of the tuning range i.e. the tuning would get a lot more fiddly. Try to get a midline unit. I believe they also go by other names, depending on the manufacturer. Of course, a big dial and gear drive need a big chassis, and Terry from Seaside Chassis, who made the chassis for The Sproutie, came to the rescue again. I decided to use a chassis and front panel that would be compatible with 19″ rack cabinets, for a variety of good enclosure options. A chassis that big needs to be fairly thick in order to still be stout and solid. 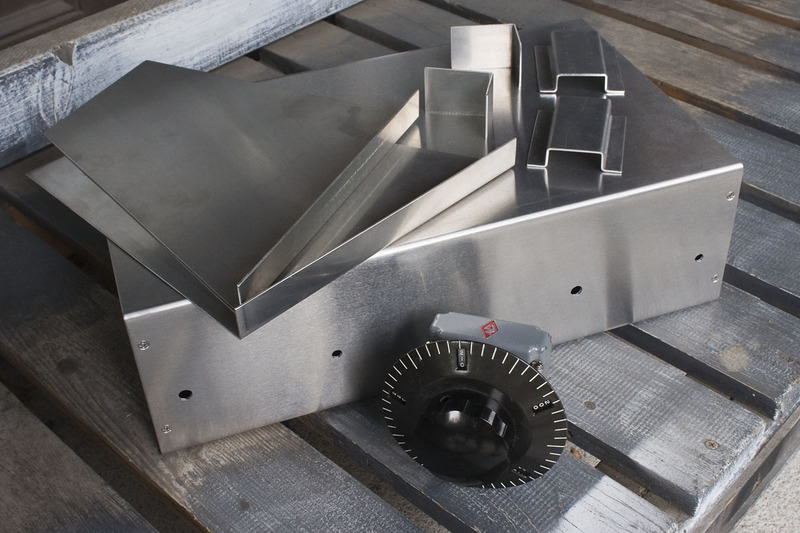 Terry does offer the use of 12 gauge aluminum for bigger enclosures, and I wanted this receiver to be big and solid (although compared to your average boat anchor, it’s still relatively light). 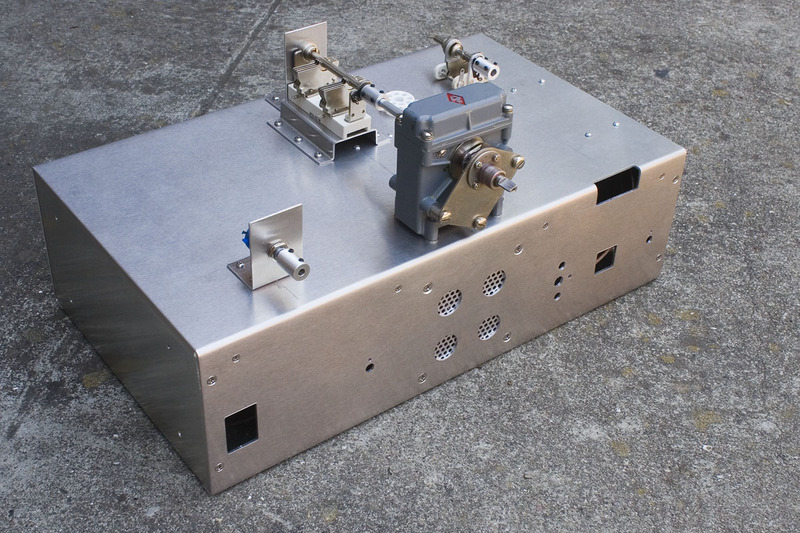 As well as a large, stout chassis, I decided that I wanted to try designing a custom front panel with the services of Front Panel Express in Seattle using their free design software. Right at the beginning of this whole project, in the first month or two of 2015, I downloaded their software and casually laid out a very rough front panel, mainly for the practice, and the fun of learning something new. As the project progressed, I’d spend a few weeks working on circuit boards, then go back to the front panel, then do a bit of work on the plans for the chassis, to send to Terry. I had an idea that, with a bit of luck, I’d complete the whole thing in or around the fall, and that’s how it worked out. At no point did I rush though. Why rush? Besides, the longer a project takes, the less it costs per month. I could see that building this regen in the way I had chosen to build it was not going to be a cheap affair, so I took my sweet time. 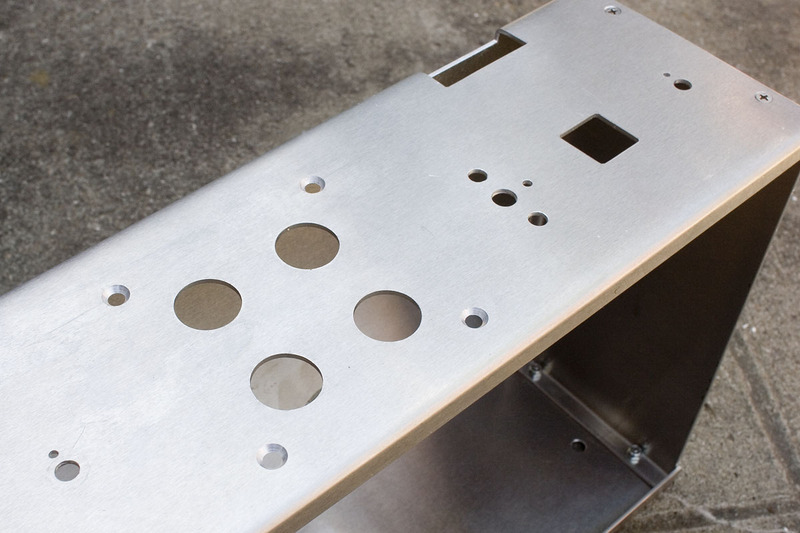 Figuring out exactly where to drill holes for controls in front panels and enclosures usually takes quite a lot of time. It’s a bit like a game of chess in that every decision you make affects everything else down the road. To make matters tougher, I have trouble thinking about more than one thing at a time, so juggling all the variables in my head takes a lot of thinking, measuring, and drawing. For front panels, I always draw the shape of the panel on a full-size sheet of paper, and place all the knobs and controls on it to see how they look in various configurations. Just when I think I have it right, I leave it and walk away, often overnight. On returning, I inevitably come up with an improvement or two. Building something like this is all baby steps for me. I am impressed and amazed by builders who claim to be able to throw something like this together in a few afternoons – this one took me over 6 months. 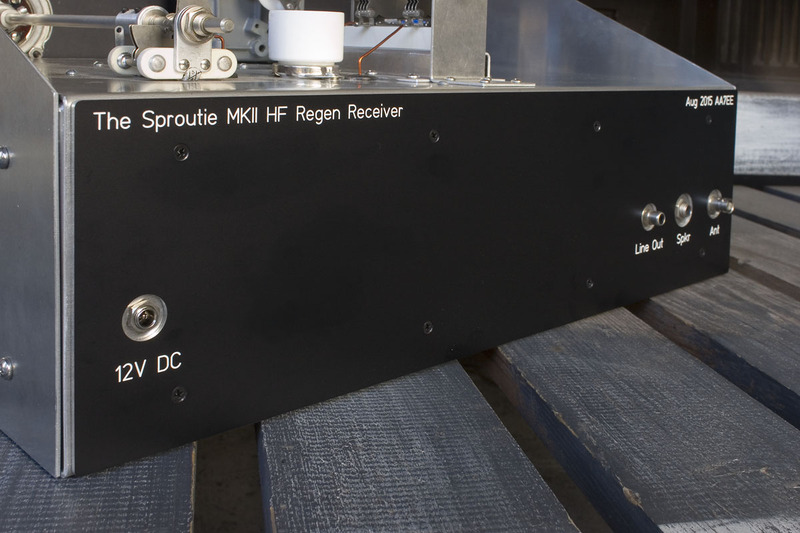 Heaven knows how long a more complex receiver, such as a multiband superhet, would take me. 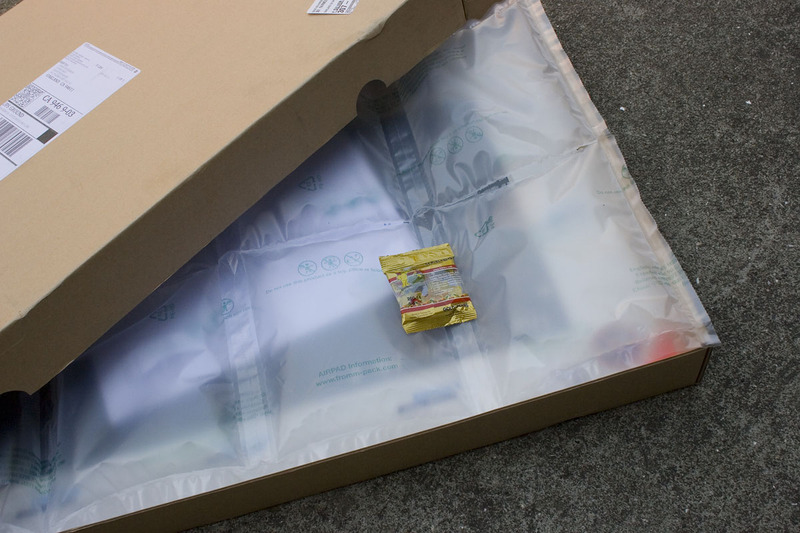 The front panel as it arrived from Front Panel Express, vacuum packed to a stiff baseboard. The metal ruler is 18″ long (the panel is 19″ wide). 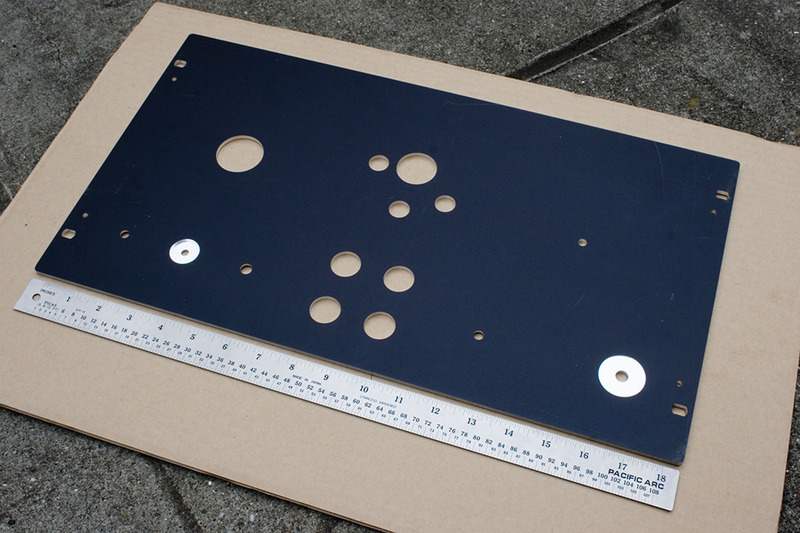 Look at this beautiful, black anodized front panel! 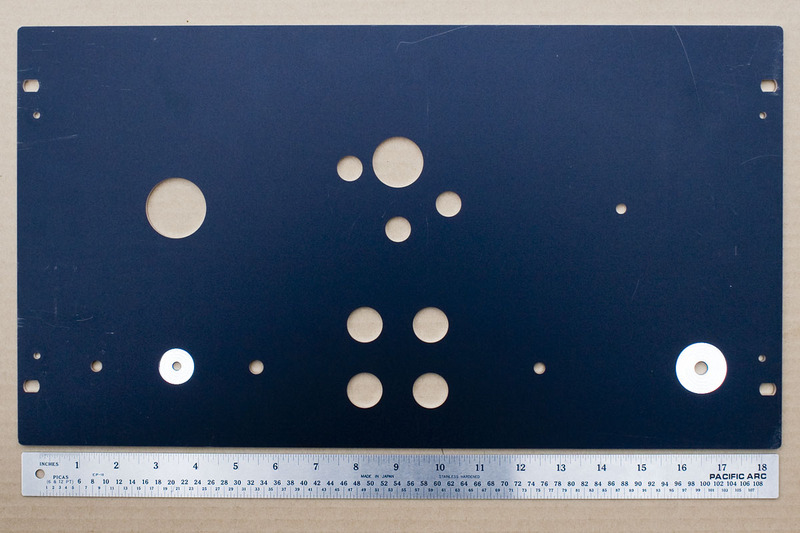 Here’s another photo, taken a bit later during the assembly, showing the placement of some of the main components. This particular National HRO NPW gear drive, unlike most that I have seen, has a shaft rotation limiter. The tuning shaft is a little on the short side. I needed to mount the gear box as close to the front panel as possible in order to be able to mount the dial properly. If you scroll back and look at the photos of the front panel, you’ll see there are 3 smaller holes located around the main hole for the gear drive. 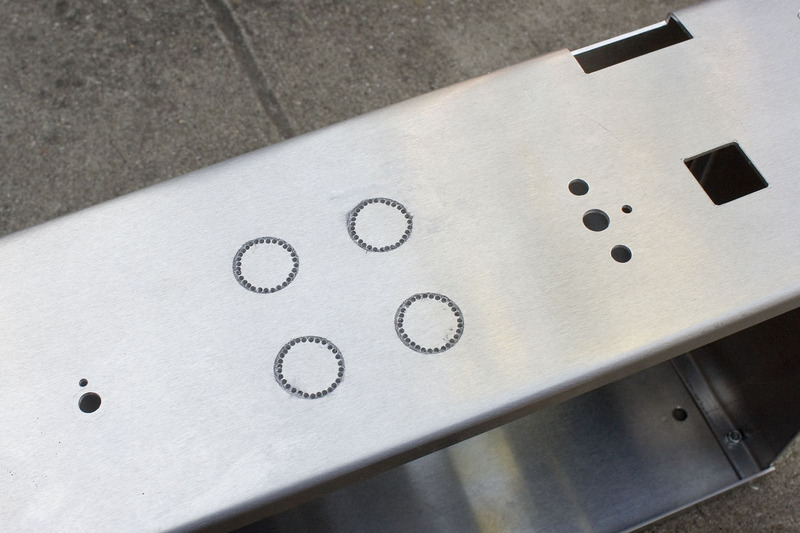 These holes helped in locating the gear box as close to the front panel as possible (the 3 screw heads fit into the 3 smaller holes on the front panel). Most of these gear boxes don’t have this rotation limiter, so the extra holes won’t be necessary. Also, do you see the aluminum shaft couplers on the regen pot and fine tuning capacitor? Those are quality parts personally machined by John Farnsworth KW2N. The one on the right is a standard 1/4″ to 1/4″ coupler, while the one on the left was made to order. It couples the 1/4″ shaft of the 10-turn regeneration pot to a short 3/16″ shaft that the National knob fits onto. 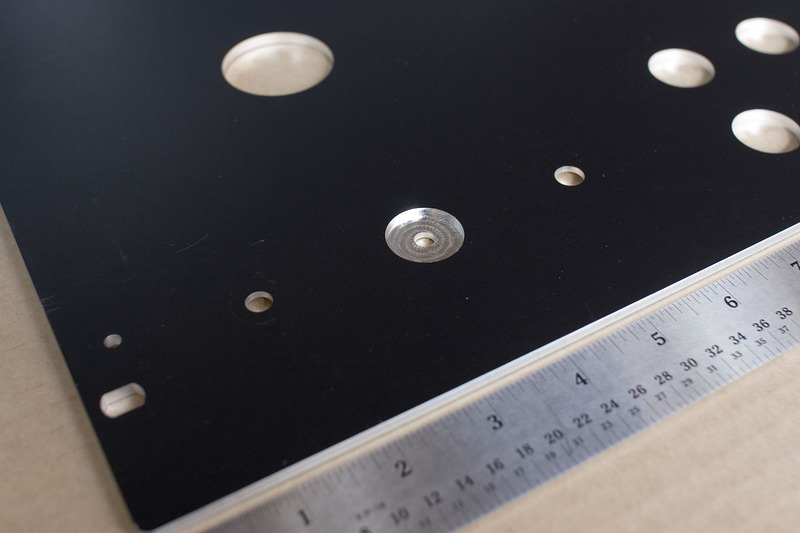 I wanted to use the same type of National Velvet Vernier knob and escutcheon plate for the regeneration that I used for the fine tuning, but I didn’t want to use the 5:1 reduction drive. I wanted to use a 10-turn wirewound pot instead, as I like the feel of those pots. From the front (as you will see in later photos) the 2 National knobs and escutcheon plates look the same. However, the knob on the left is connected directly to the 10-turn pot and not to a National Velvet Vernier reduction drive. 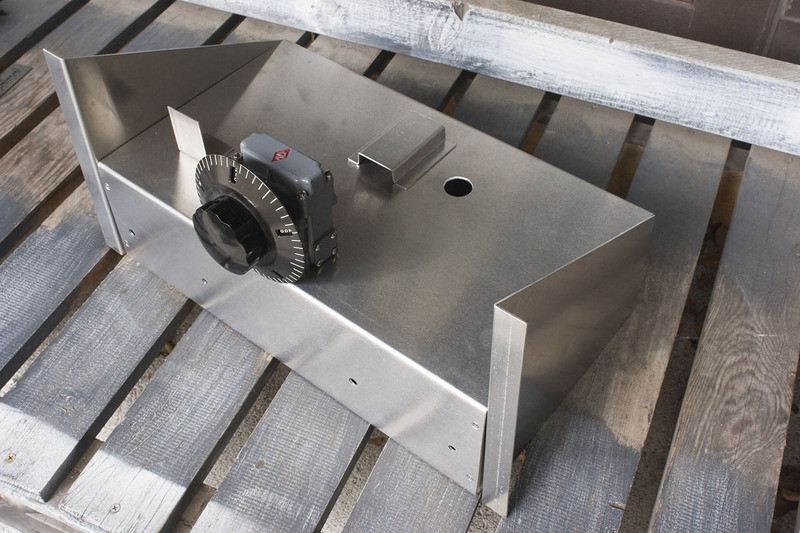 The black escutcheon plate for the regen control is spaced away from the front panel by one washer thickness, and bolted to the front panel with 4-40 hardware. It is not used for anything, other than looks. 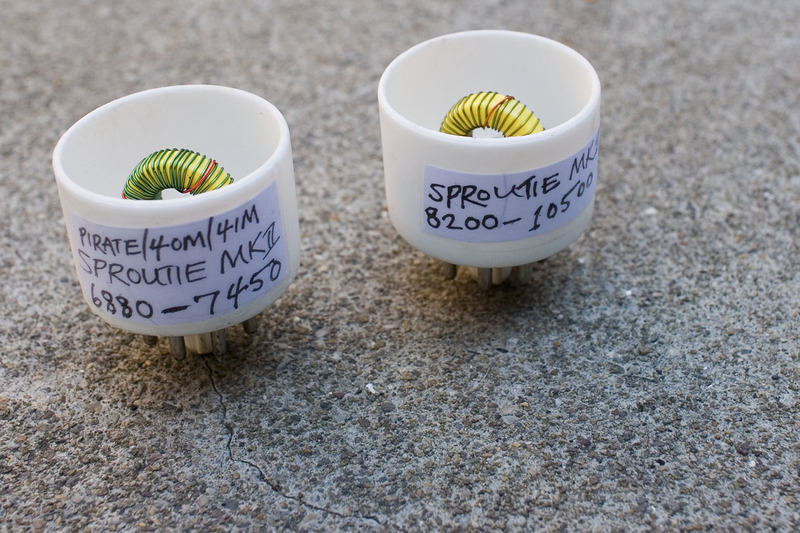 Coils were constructed in the same fashion as the coils for The Sproutie. 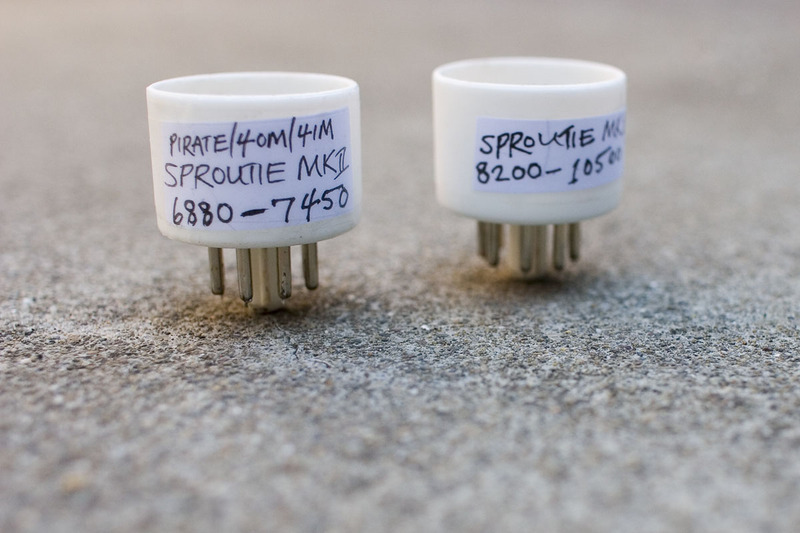 In fact, the pinouts used on the octal socket are the same, so my Sproutie coils work in the Sproutie MK II, though they cover a wider range, due to the greater maximum capacitance of the tuning capacitor I used – a 2 x 50pF instead of the 2 x 35pF used in the original Sproutie. I decided to wind a complete set of new coils for this receiver. As of writing this post, I have 6 coils wound with a few more to go, as needs and desires dictate. You’ll need to figure out the exact details of your coils with the help of online calculators (I like the ones on W8DIZ’ site) and good old trial and error, but here are my details – they should give you a start. Remember to take into account the values of main and fine tuning capacitors, if they are different from mine – and the value of that 39pF capacitor between the tank and the base of the oscillator transistor, if you try a different value. I’ll update this table as I wind more coils. 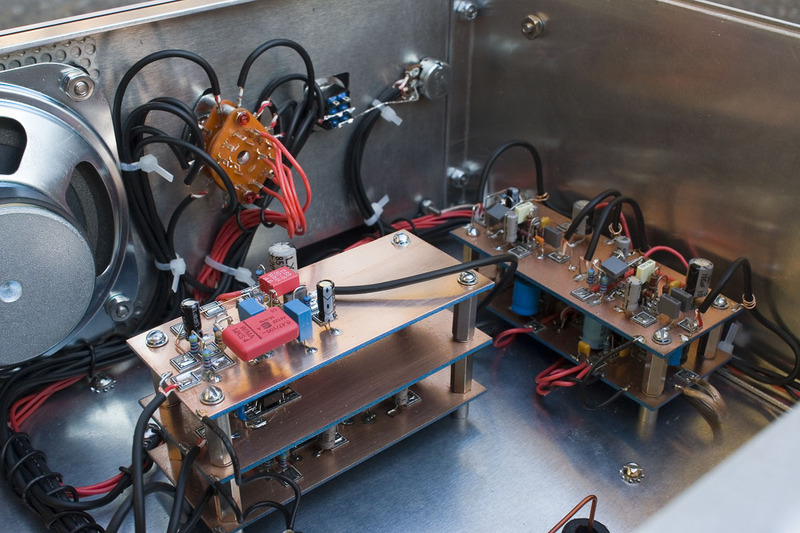 The plan is to wind general coverage coils up to about 21MHz or so, and a few more coils for specific bands. It is much easier, with the aid of the dial calibration graphs, to pinpoint exactly which 5KHz channel you are on, when the band coverage is limited to 1MHz or less. 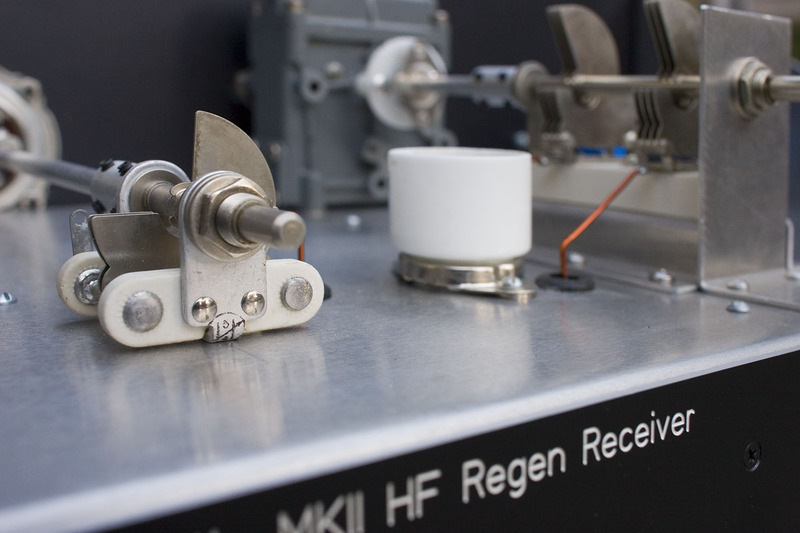 With the 20:1 reduction ratio of this National HRO drive, and the large, relatively massive dial, I found it quite easy to tune in stations even on the 13500-18300KHz coil, which spans almost 5MHz. 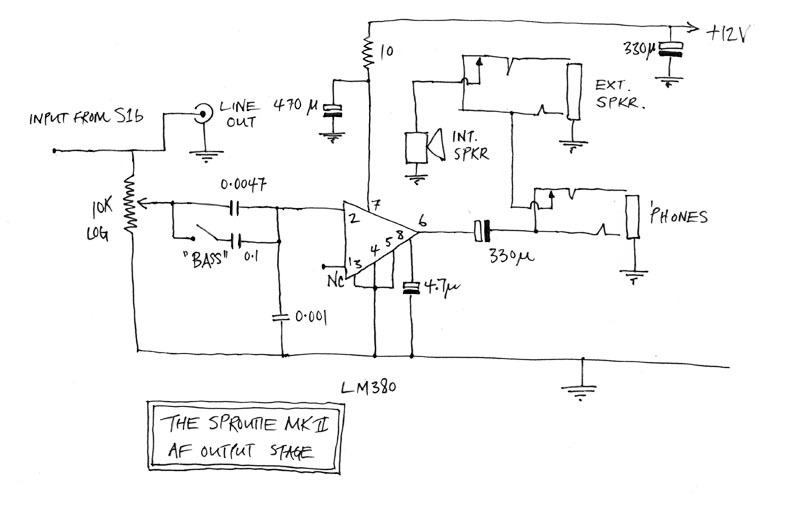 For pinpointing which 5KHz “channel” I am on though, a general coverage receiver to listen to the oscillator of The Sproutie is more reliable (and faster) than reading dial calibration graphs. A quick word about that regen control. 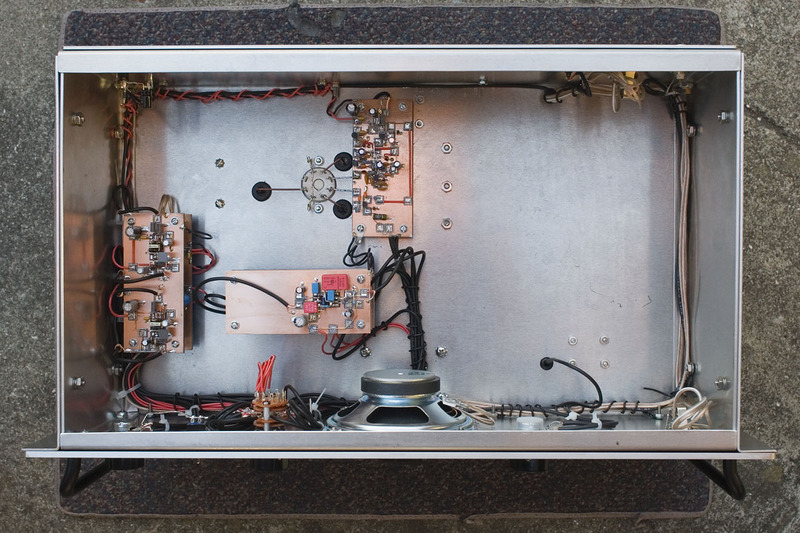 On first installing the main RF board, one filter, and the AF amp into the chassis, I noticed that occasionally, when receiving a strong carrier, I’d hear a ringing in the speaker. My first thought was that it was microphonics caused by physical feedback between the internal speaker, which was bolted to the chassis, and some part of the circuit. Plugging in headphones didn’t cause it to go away, however. Undeterred, I continued building, and it was only after finishing the whole receiver, that I realized what was going on. I discovered that if I hear a ringing, all I have to do it back off the regeneration control a bit, and it disappears. I think this ringing is due to the high Q of the circuit when set right at the threshold of oscillation. If you recall Dan N7VE’s presentation on filters that I referenced earlier, he talks about how ringing in filters is caused by abrupt phase changes at the edges of the passband. The cure, when designing them, is to limit the Q in any one stage. Similarly, if you experience ringing in your regen, backing away from the critical threshold of oscillation will lower the Q of the circuit, and should solve the problem. Fascinating. I’ll be interested to hear if any other regen operators have experienced this. My guess is this would be less likely to happen in a regen that utilizes a bipolar transistor for the detector (or combined oscillator/detector if it’s just one device, unlike this design). I like this receiver as it is, with the partially open chassis. From using The Sproutie, I have become used to seeing the vanes of the variable capacitor rotate as I tune the band, and I like that. I like seeing these vintage radio parts in action. However, I did learn from The Sproutie that whatever isn’t covered picks up dust – and when you’re living with 3 cats, 2 of whom are long-haired, a lot of cat hair too. 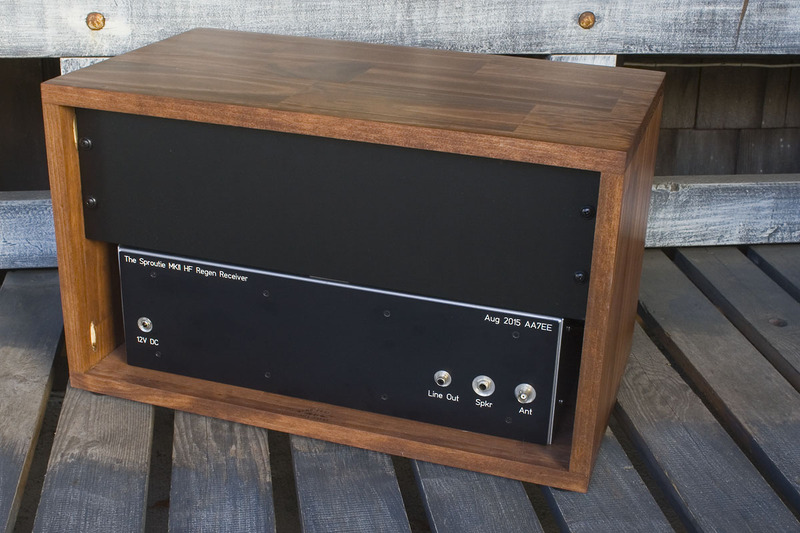 I designed this receiver so that it would fit any standard 19″ enclosure that is also 6RU (rack units) or more high. The first plan was to make use of a hack (as the kids call it) of an IKEA product to make a low-cost rack cabinet. The IKEA Rast nightstand is the right size, and only costs US$14.99. For that, and the cost of a pair of rack strips, you can have a rack cabinet that is either 6RU or 8RU high, depending on how you construct it. A Google search on “IKEA Rast rack cabinet” or similar will yield a lot of sites and info on how to do this useful mod. After finding his site, I was hooked. Yes, it was going to cost more than the cheap IKEA hack but at some point during the design and construction of this regen, I decided that I wanted it to look really nice, and expense was going to be a secondary concern. I was going full-hog on this. Besides, it took me over 6 months to plan and put together and spreading the cost over that time, the cost per month for my hobby was actually quite reasonable – especially if I take into account all those movies and dinners I didn’t go to because I was at home building! Incidentally, David’s racks are most definitely not expensive. When you consider the cost of your standard rack cabinet – the ones you find in music stores that are made of heavy particle board and covered in black veneer, his racks compare in price very favorably – and they are vastly nicer. They’re not ideal for the rough life of touring but for a home studio, they are perfect – and very good-looking. The National HRO gear box does have a small amount of backlash – even when I apply as much tension to the anti-backlash gear as my poor little fingers can manage. At first, the backlash was something like 1 – 1 1/2 dial divisions. After increasing the tension on the anti-backlash gear as much as I could reasonably easily manage without the use of tools, the backlash, though still there, decreased to about 1/2 a dial division. It is a small amount, and also predictable, so not really a problem. For the purposes of dial calibration, I always turn the dial in the direction of increasing frequency before taking a dial reading. This ensures consistency in the readings. 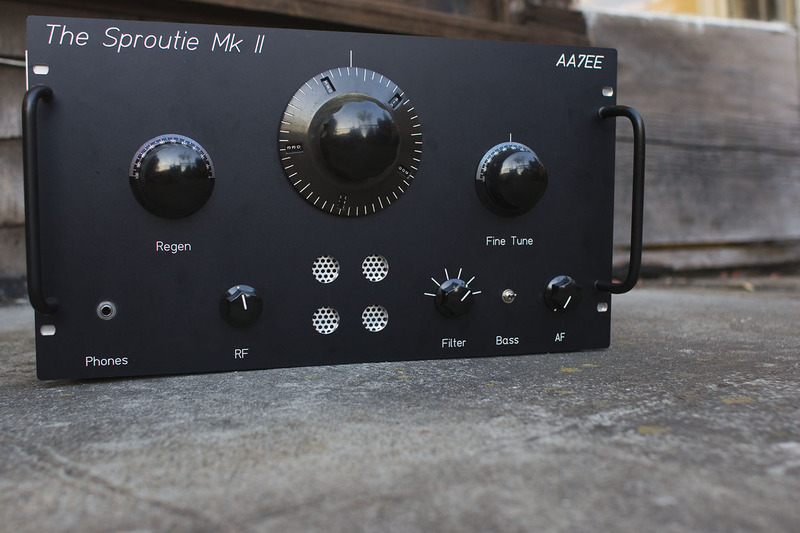 There are some more videos of the Sproutie MK II, showing how a regen can be used in exalted carrier mode to enhance reception of weak AM stations, and on the 25M band, in this slightly more recent post. 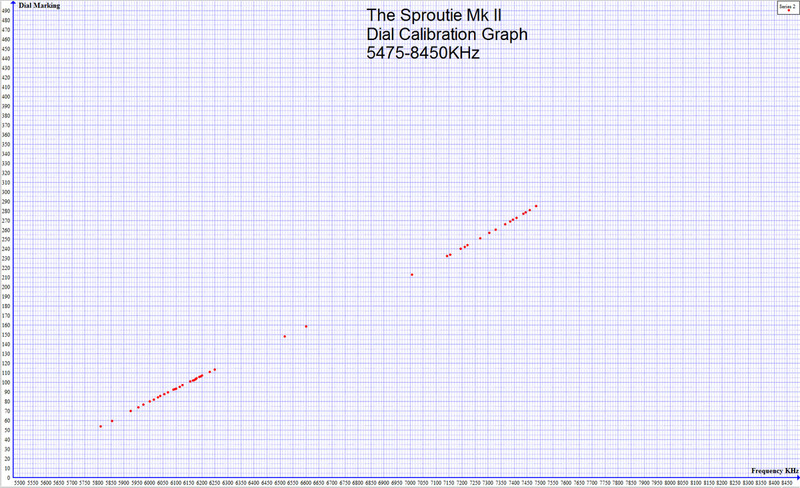 There are a couple of things about my Sproutie MK II build that I’d like to change. The first is that, especially at the higher frequencies, the set is slightly sensitive to physical shock. A knock on the cabinet will shift the frequency slightly. I don’t recall noticing this effect with the original Sproutie, although to be fair, I didn’t do as much listening to SSB and CW with it as I do with the new receiver. 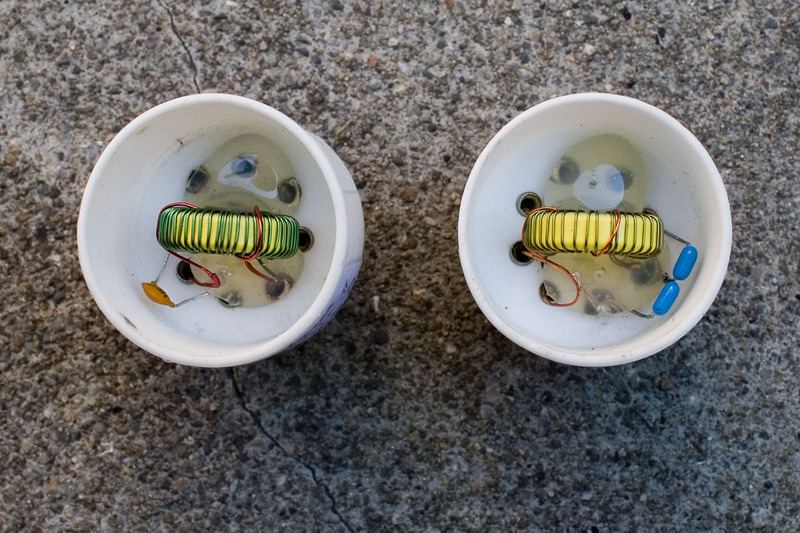 I think one reason for this slight frequency shift may be the fact that the thick wires connecting the 2 stators of the main tuning capacitor to the coil socket are longer than in the original Sproutie. Although the effect is only slight, it is there, and that bugs me. It may also have to do with the much larger chassis, meaning more metal in the vicinity of a tuned circuit, that flexes when a physical shock is applied. The more I think about it, the more I think this second factor is the main reason. In practice, it is not a problem, but it is there, and I’d like to reduce it, if not eliminate it completely. Fixing a bottom plate to the chassis may help in this regard. 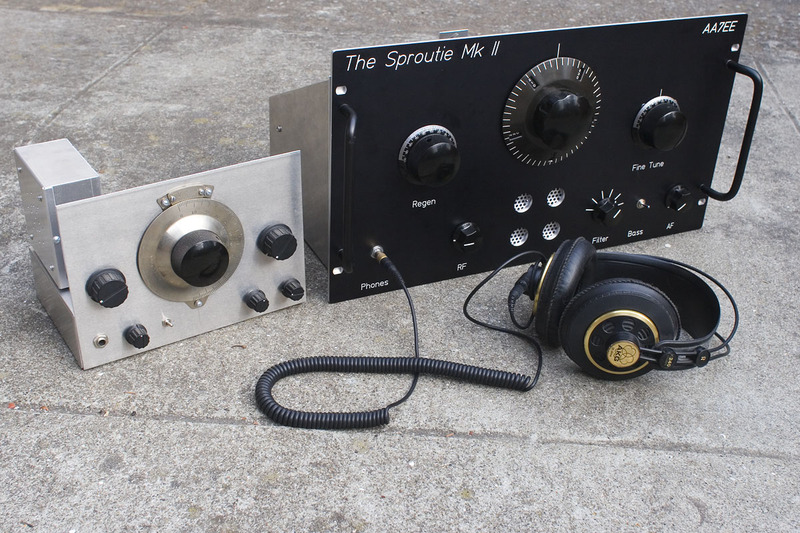 Incidentally, banging the desk on which the Sproutie MK II is sitting has no effect. The rubber feet probably help a lot. 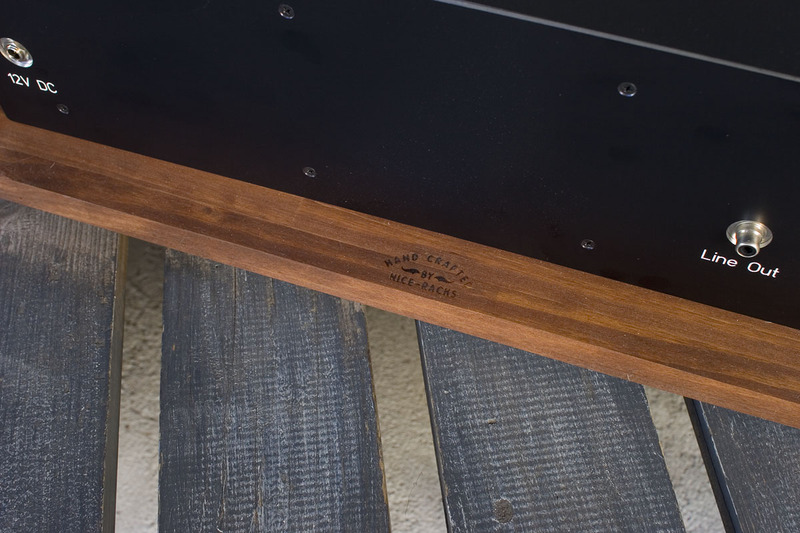 The second thing is that, because the cabinet is wood, the receiver is not completely shielded. 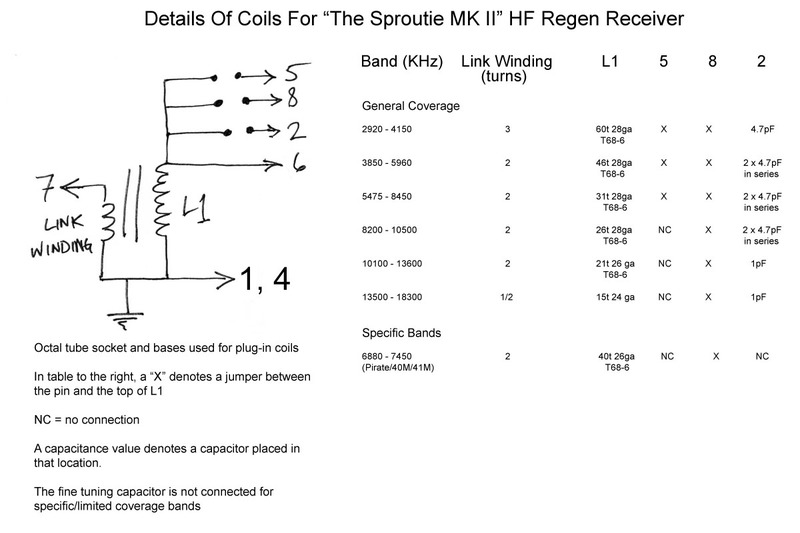 This would be useful were I to wind a coil for the 2-3MHz region and use The Sproutie MK II in conjunction with crystal-controlled converters to cover specific bands. 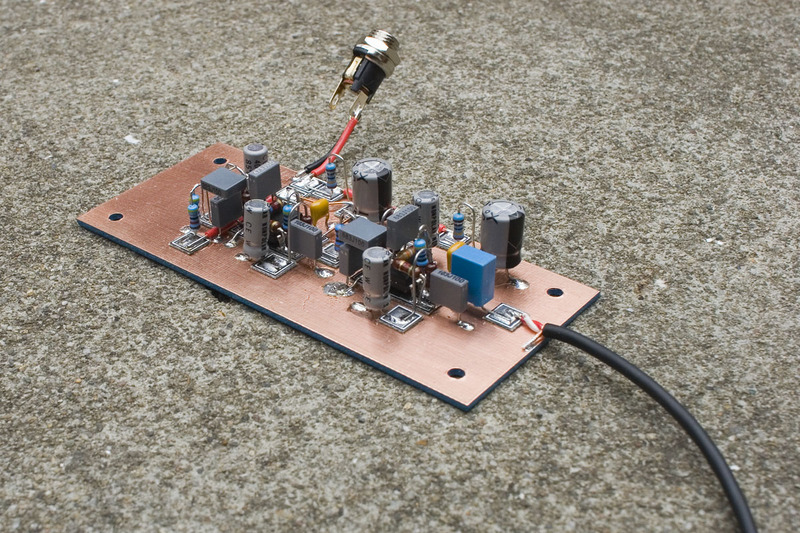 This is a Regenorodyne approach, like Gary WD4NKA’s inspiring Regenerodyne receiver here. It would also be nice to reduce the possibility of picking up very local QRM in the shack. 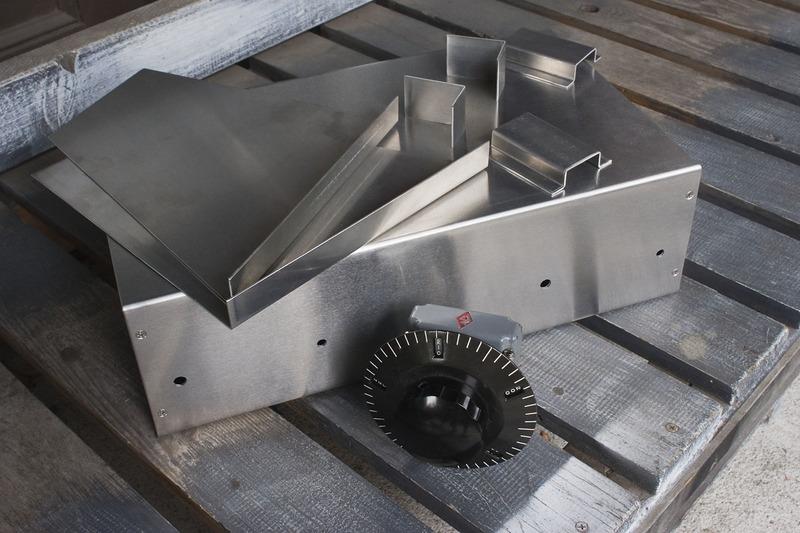 I could achieve better shielding with my Sproutie MK II by either simply housing it in an all-metal rack cabinet, or by cladding the interior of the existing wooden rack cabinet with thin metal plate or mesh. There is absolutely no hand-capacitance effect when using the set, due to the metal front panel, but when my cat Sprout jumps up on top of it (as she often does) the frequency shifts by about 20Hz. This is also due to the lack of shielding on top of the set. Again, it is not much, but it is there. 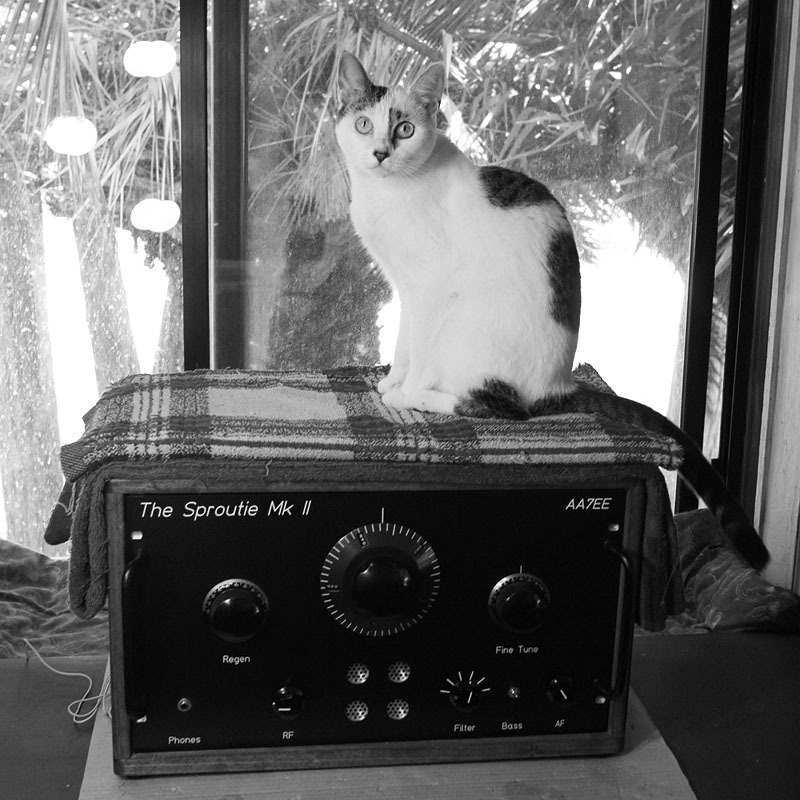 Sproutie (aka Sprat The QRP Cat) and The Sproutie MK II. Her contribution to the dial calibration of this receiver was carefully knocking the plug-in coils off the top of the receiver and watching them hit the floor. 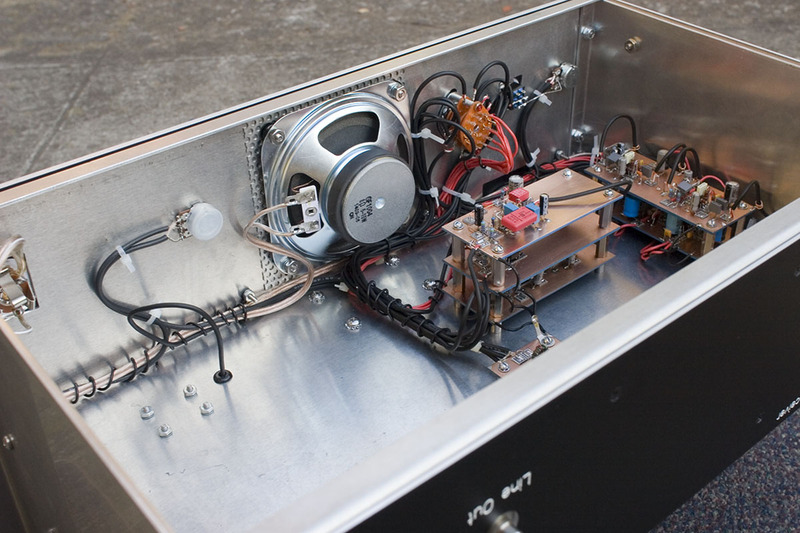 Posted in Amateur Radio, homebrew radio, Shortwave Radio.Tagged Front Panel Express, HF Regen Receiver, Jim K4XAF, John Farnsworth KW2N, NR5Q, regen receiver, Regenerative receiver, Seaside Chassis, The Sproutie MK II, The Sproutie Regen. Really superb work! I envy you for the patience and resolution to do the best workmanship possible. 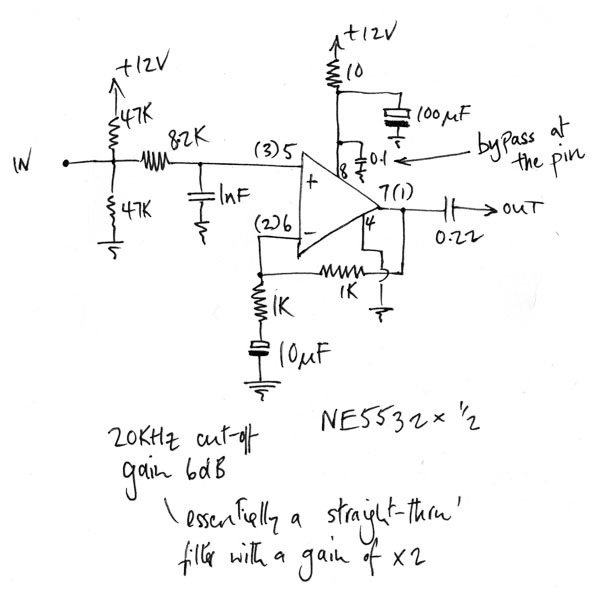 Why not use a switched capacitor low pass filter like MAX7400? Changing its oscillator frequency controls its bandwidth. It has a much steeper frequency response than active filters. Thank you Victor. I really appreciate your kind comments. A SCAF is certainly an option. It would need to installed after the AF output stage, as I understand they are relatively noisy. Making and installing all these separate filters was more work than necessary, I think! Beautiful work as always – just W.O.W. !! Thanks Alan – coming from a real engineer, I really appreciate it. Loving your Drake 2B videos, by the way. About using the MAX7400 SCAF,assume you put the filter at the detector output. If a very strong signal will generate at that point a voltage swing of 4Vp-p then the noise floor of the filter would be 90 dB below that because the data sheet graph shows 80 dB Signal/Distortion+Noise with audio bandwidth of 22 KHz. If you use a bandwidth of 2.2KHz then noise will be 10 dB lower, getting 90 dB of S/D+N which should be good enough for getting good dynamic range for the receiver. 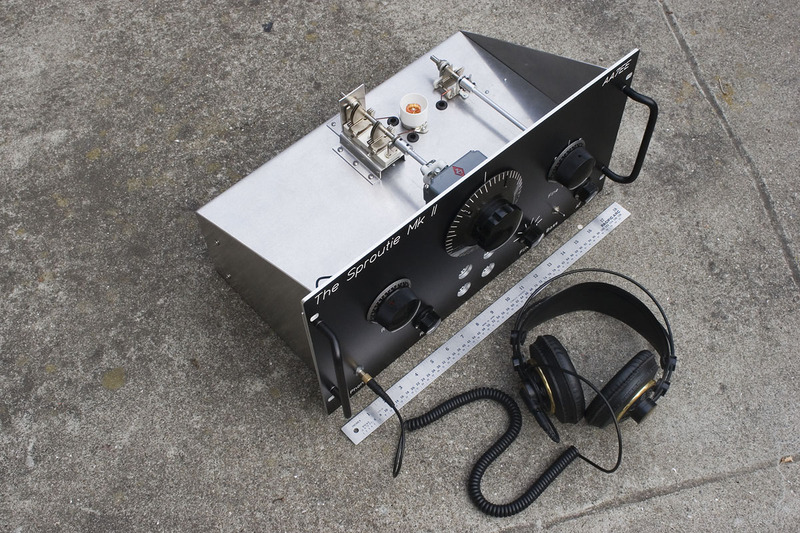 Fokko – I’ll be interested to know how the Micro 40 works with a 50W amp. Make sure your output is adequately filtered. Best of luck! Dave, I am speechless, what a beautiful piece of equipment, you really out did yourself this time. Thanks for sharing those great videos also. I am envious of your crafting abilities. Please don’t stop. Joel – That means a great deal – thank you. I love this construction technique! And this project was so well done! Great Job! Hey, WOW! This is a wonderful peace of art and engineering. Really beautiful and well done and it works great as far as I can tell seeing the video. Thanks a lot for sharing. Thank you Celso. It does work quite well. I will try to post more videos and/or recordings in the near future. Could you tell me where I can find the pads on which you solder the components, please. I glue them onto the substrate with superglue gel. The liquid form of superglue gets messy and awkward to use. The gel works a treat. Incredible Dave. This is amazing work! I’m going to read through this a couple of times to absorb it all. Again, awesome awesome job! Thank you Patrick! If you do check back in the future, make sure to clear your cache in order to get the very latest version, as I make corrections and additions from time to time. It makes me happy to be able to share! Once again you have produced a magnificent work of Radio Art! Moreover, by sharing the details in your blog, you both inspire and instruct. Bravo, Dave! Mike, you’re too kind – thank you! I build this gear for me, but sharing is a natural progression, and feels like the last step in the journey. As the protagonist in your own homebrew odyssey, I know you can relate. Fantastic product of your imagination. So glad you shared it, so we all can see this work of art. It never ends when you’re a homebrewer! Absolutely magnificent! A true work of art. Hard to believe it is a regen with all of the bells and whistles! Superb is a really good word! Beautiful receiver, Dave! And built like a tank! Appears to be rock solid on the cw and ssb reception. I like how all the mechanical parts are on the top of the chassis, reminds me of tube construction. I have never used a National dial drive such as this, it looks to be ultra- smooth. Thanks Doug. Yes – this National dial and gear drive are very smooth. It makes tuning the receiver a real joy! Dave, beautiful work…it sounds lovely via YouTube so I can only imagine how it must sound in person. Fantastic! Thanks Brad – I really appreciate it! It is so kind of you to upload this and share it with like-minded enthusiasts. Keep them coming. It’s funny you mention the thing about the vacuum tube rig Mick because shortly after completing it, I was wondering if I should have made it a tube design instead. I do like the power efficiency of solid state though. I keep this receiver running 24/7 from a small set of gel cells under the desk hooked up to a float charger. They power my K2 as well. 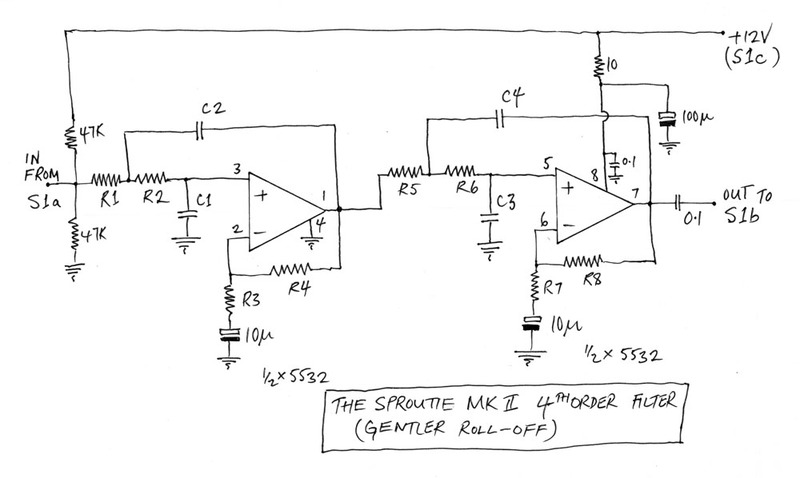 The Sproutie MK II only consumes somewhere in the region of 50mA at 12V on band noise or with the volume low, rising to ~100mA on a loud station, so I just keep it on all the time! I am not a member of any local clubs. Although I’m affable in person, I’m a bit of a loner, and not a “joiner” by nature. I do like to share details of my projects through this blog though. My projects feel complete when I am able to share them. I’m not trying to give a detailed “step by step” approach, but more of an overall picture, with enough detail to help anyone planning something similar. One person might just look at the pictures and get an idea for their own project, while someone else might copy the schematic faithfully. If in some way it helps and gives a reader some ideas, then I think I have contributed in some small way. No more big projects for quite a long time though. I’m tuckered out, and need a break! I’m feeling the urge to kick back, listen to the receiver a bit, put a few more videos online, wind a few more coils, maybe make some tweaks to it, but nothing serious. The hot weather isn’t helping either! “C’est beau un homme qui sait ce qu’il fait !” is the first comment that poped up to my mind when I saw your new marvel. 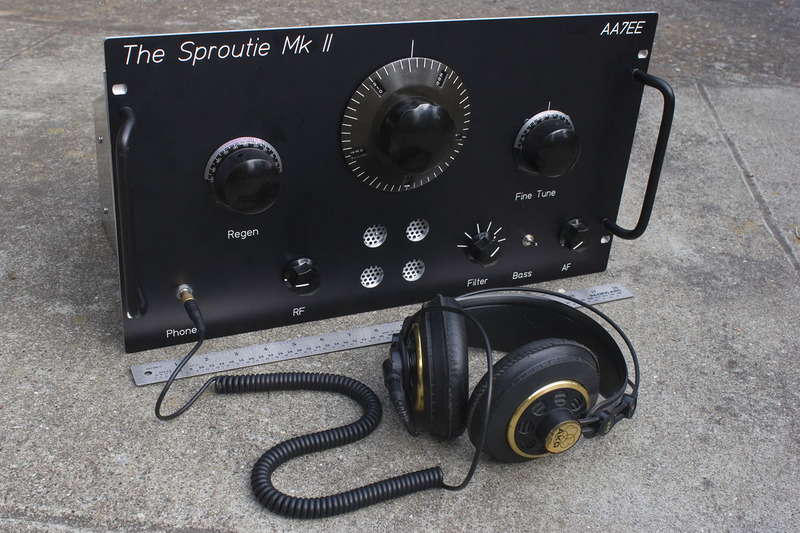 It will push me to upgrade my ugly version of the Sproutie 1 to something with a better look and the new modifications you are proposing. All the parts I used came from my junk box but for the version I have in mind I will try to find out better part. I realize how difficult it is nowadays to find a good variable capacitor, which by the way is one of the most important part of the receiver. I have a couple of occasions to listen to my receiver in Paris and it is definitively a surprising receiver. My first version was made during hollidays in a place close from the see and the reception conditions were much better than in the center of Paris. So, I let you know soon were I am with the new version of the Sproutie. All the best and 73 from F6GMQ Henri. Henri – I live in a built-up urban area too, and often envy my friends who live in more remote areas, and have much better shortwave reception. That’s good to know that you tried this little regen away from the city! It might be worth having an AF output socket on the back, so you can take the AF directly from the detector and use an outboard filter. An adjustable filter would be fun. There are so many possibilities. If you’re not careful though, you can end up turning a simple receiver into a very complicated one, which is almost what I did with my Sproutie MK II. It’s fun to experiment though. 73 to The Sproutie in France from The Sproutie in California! To my surprise I recognise this circuit for the Sproutie Mk2 [Shown in picture 2] – because I happen to be building the same thing. But mine didn’t come from Sprat – its come from the RSGB Radio and Electronics Cookbook published by Newnes dated 2001. Virtually everything is the same with the odd component change. Why it interested me is because its listed not as a Regen, but a Q Multiplier design, with the Q Multiplier being provided by TR2, the bipolar transistor. The original circuit specifies 2N3819 Fets. The audio filters are not shown nor described in this article while the output stage is given as the usual ‘386 chip – one of the things I don’t like and don’t want to build into mine, while you’ve chosen a ‘380 which is a better choice. 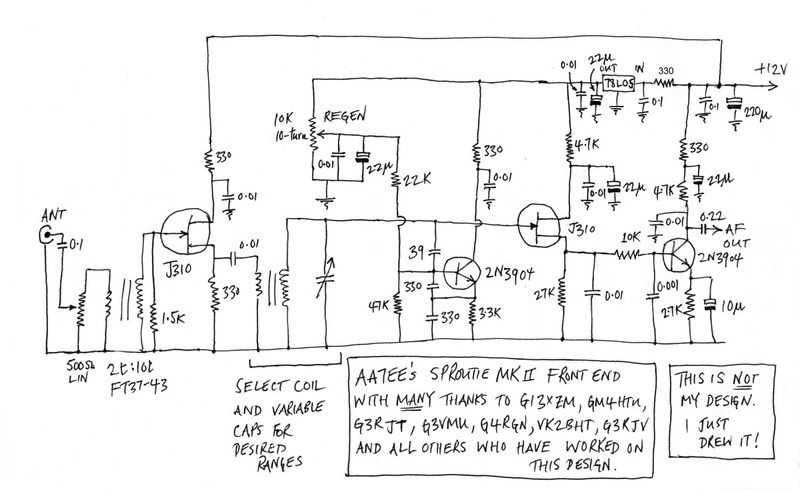 Alex – I didn’t know this circuit was in the Radio & Electronics Cookbook, but it seems to have popped up in many places. 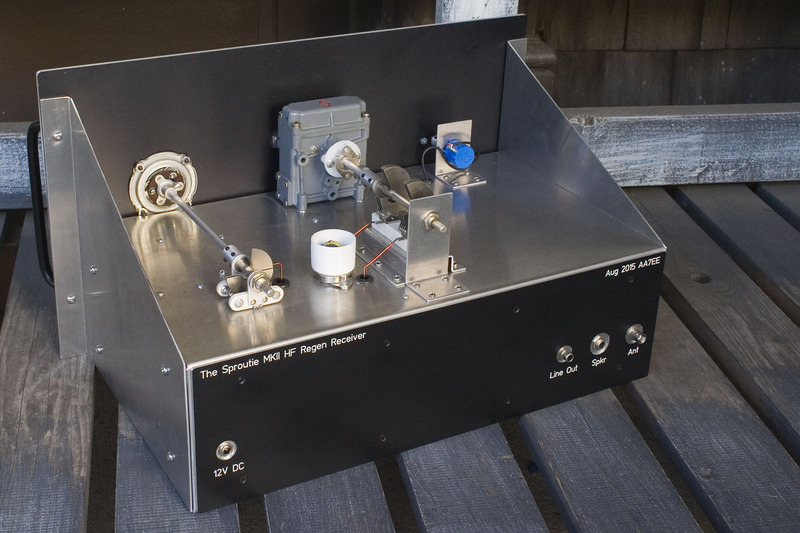 It is in EMRFD (Experimental Methods in RF Design – an ARRL publication), as well as having been used by George G3RJV in his column in PW, and in the WBR regen recever. I’m sure it has cropped up in other places too, as it seems to be reliable and works well. Oh, yes – those LM386’s. I understand their appeal to constructors who are either looking for an AF output stage with low quiescent current and/or high gain coupled with circuit simplicity. Some builders like it in the lower gain configuration. I admit that I have never used it in the lower gain configurations but I understand it is still relatively noisy. 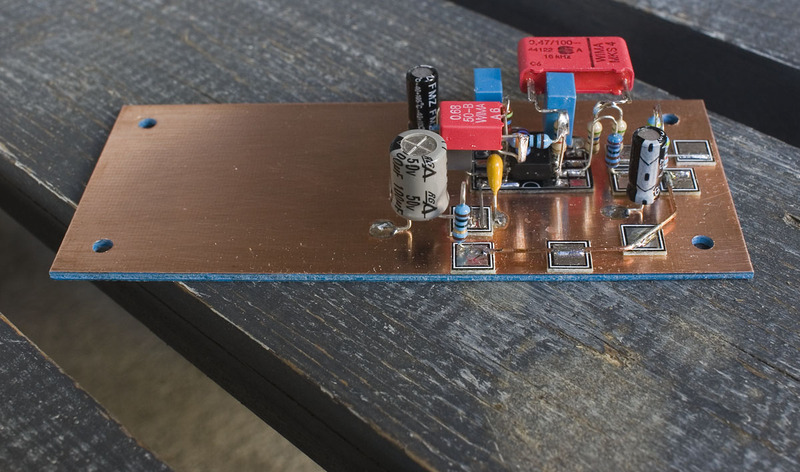 I moved to LM380’s because I wanted to be able to build receivers that I would be comfortable listening to for long periods of time, and which could put a bit more AF power into a speaker than a ‘386. The LM380 is at this point of course, quite an old chip. I know there are IC’s out there that are even lower noise. At this point though, in my opinion, any further reduction in noise is mainly academic. The difference in noise between an LM386 with a 10uF cap between pins 1 and 8, and and LM380 is huge – as you know. I love having a receiver that is a pleasure to listen to for long periods of time, and all for the price of a chip that costs about a dollar – a bargain, I think! I just saw your website. What a multi-faceted site with so many subjects. I will have to take a look later on when I am less busy. Thanks for the kind words. 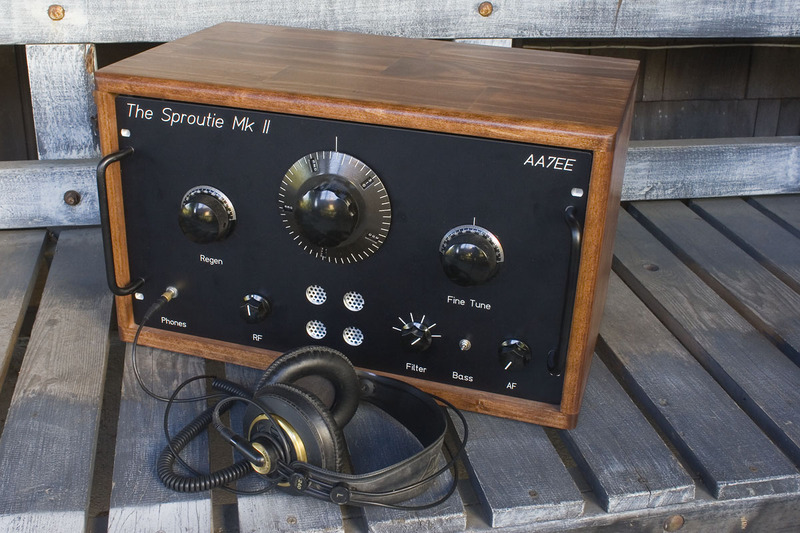 The Sproutie MK II was a labor of love, for sure. I am still tweaking the filters, though I am itching to be able to retire this project and give it a break. You know how it goes though – there is always the desire to make things work just a bit better. It’s the engineer/tinkerer’s curse! I was upset when you “beat me out” on the HRO dial on ebay—however, seeing the BEAUTIFUL job you’ve done on the final product, my upset has changed to utter pleasure at seeing such an excellent job. Much, much better than I would have done. Bob – I feel bad about that – my apologies! However, if it helps, I’m not doing very much buying of vintage parts on eBay right now (and maybe not for a while). 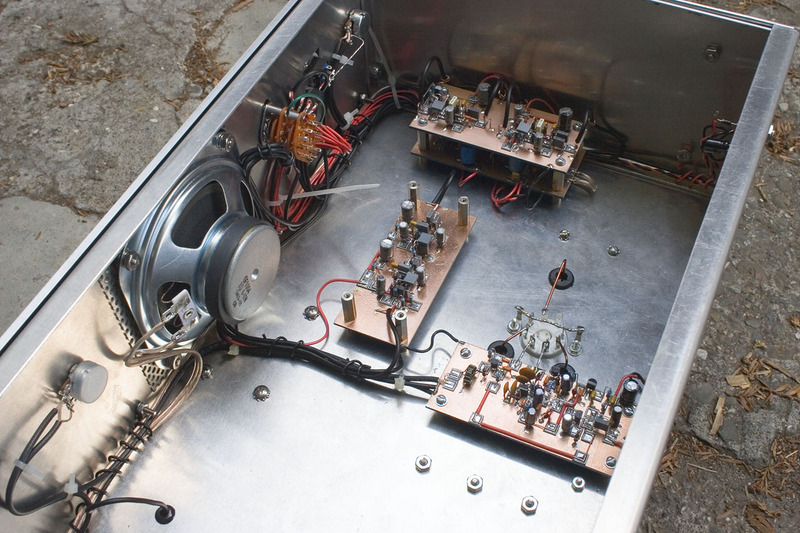 Constructing this receiver took so much time and effort, at the glacially slow pace at which I work, that I cannot contemplate building anything similar for a while. I need a rest, and a slight change in direction for a while. Thank you so much for the compliments. To be honest though, if you saw the sheer amount of time I spend on these things, you’d probably be wondering why I hadn’t achieved more! Thank you Frank! It’s not perfect but, as the Grace Jones song goes, “It’s perfect for me!” Actually, she sings, “I’m not perfect, but I’m perfect for you” but the sentiment is the same. I know I’ve probably said this before, but I am terribly guilty of having typecast you in my head. Every time I think of you, I see an image of a cat in an orange astronaut suit! 73 – and great to hear from you! Hi Dave, your receiver looks and sounds superb. I’m so impressed that I’ve begun construction of my own poor version. I’m having a problem sourcing the valve bases; when I Google ‘valve base’, all the results I get are for valve sockets. Can you either let me know what your search term was, please. Or better still, give me the name of the supplier from which you got them. Angela sell on eBay under the name angelainstruments. I’m not sure how it works buying from them in the UK, but as a US buyer, I have found that if I want just a few, it’s cheaper to buy from their eBay account where their prices are a bit higher, but they offer “free” shipping. If I want more, then it’s a bit more cost-effective to buy from their website. Of course, as you’re in the UK your mileage, as they say, may vary. I think these bases and sockets are manufactured in China so if you look around, you may find a cheaper supplier. I’m afraid that, having not lived in the UK (which is where I assume you are, as you call them valves) for almost 30 years, I am not familiar with suppliers there. Hi Dave and thanks for the response. I didn’t expect you to know about UK suppliers; I assumed you got your parts from within the USA. As I said, my problem was that all I got from Google searches was valve (okay then, tube) sockets, which, for some reason, everybody (including me) calls valve/tube bases. I’ve dealt with Angela instruments in the past, so I’ll check them out. I would have used parts from my bits box if I’d had anything suitable, but I confess, I prefer to use new parts when possible. Your method looks ideal, so I thought I’d give it a go. PS Yes, I live in the UK. In Scotland, in fact. John – let me know if and when you build anything. I love to know what other folk are building. Us home-brewers gotta stick together! Your “PCBs” are so the most beautiful ones I have ever seen! I never liked the upright position of parts, but these pictures convinced me to try it myself! Thank you, Mofapilot. The upright parts allow me to have a more compact layout, and I have grown to like the look. Best of luck with your own endeavors! I am French so…. sorry for my English. Anyhow. Great job for this amazing receiver. 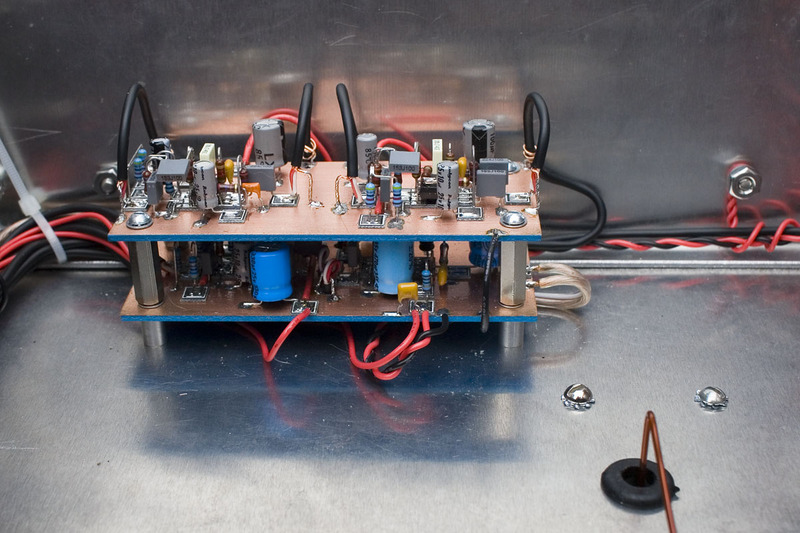 I am tried to build one at home and I am wondering what kind of wire do you use to build the primary coil on the FT37-43 tore. I mean the one between antena pot and the gate of the first J310 ? It is not important what size you use Thierry. It is an untuned broadband stage. You are just coupling some RF into the stage. Use what you have! Thank you Andrew! I considered building NR5Q’s Ultimate Regen, as well as adding a solid state version of the filter to one of my Sprouties. For me, it comes down to the fact that building is a very time-intensive process, and I am not a very prolific builder. It is much easier to have ideas than to actually see them through to completion! I think my regen odyssey is, at least for the time being, at it’s end point. Great ideas though, and thank you so much for the kind words. I’m truly flattered or, as we Brits would say, “dead chuffed”! Previous Post A Sproutie is Born in France, to Henri F6GMQ!